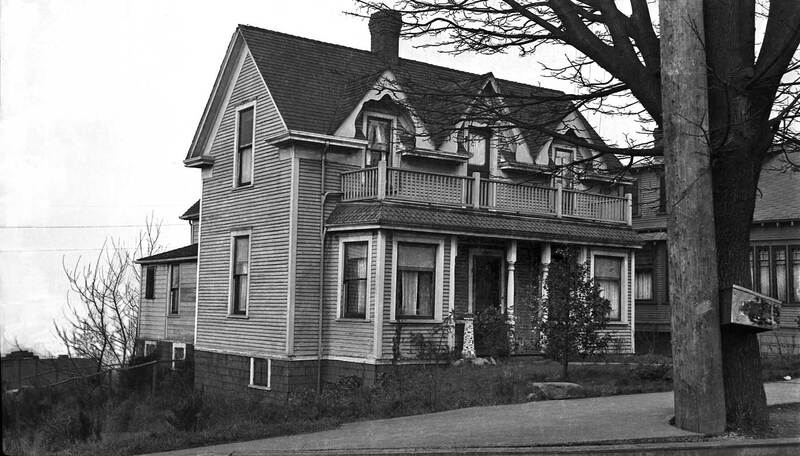 On a spring day in 1985 Raymond and Zia Hachiya purchased the “Brewer House.” It was named for the Walla Walla family that built it in 1890 as a Victorian show place for the 40 acres they platted in reasonable hope of making their fortune in the central district of what was then a roaring and generally lucky Seattle. They named their addition after Walla Walla. 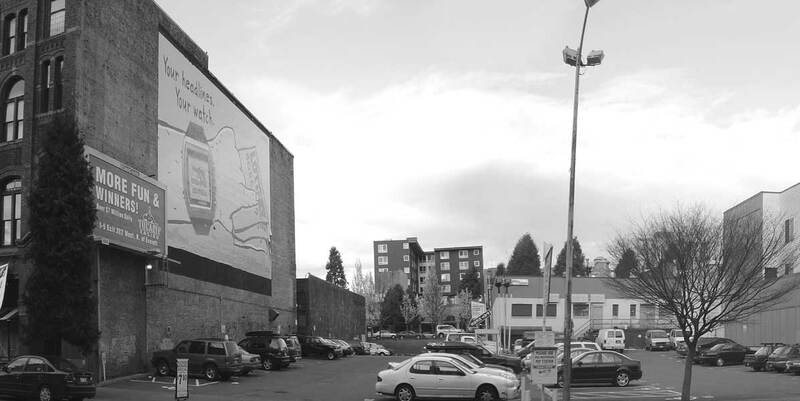 At the southeast corner of Columbia Street and 21st Avenue, their home was conveniently only five short blocks from street car service to Pioneer Square, or a mile and half walk to the same destination. The gallant couple stands before and below their recent purchase. 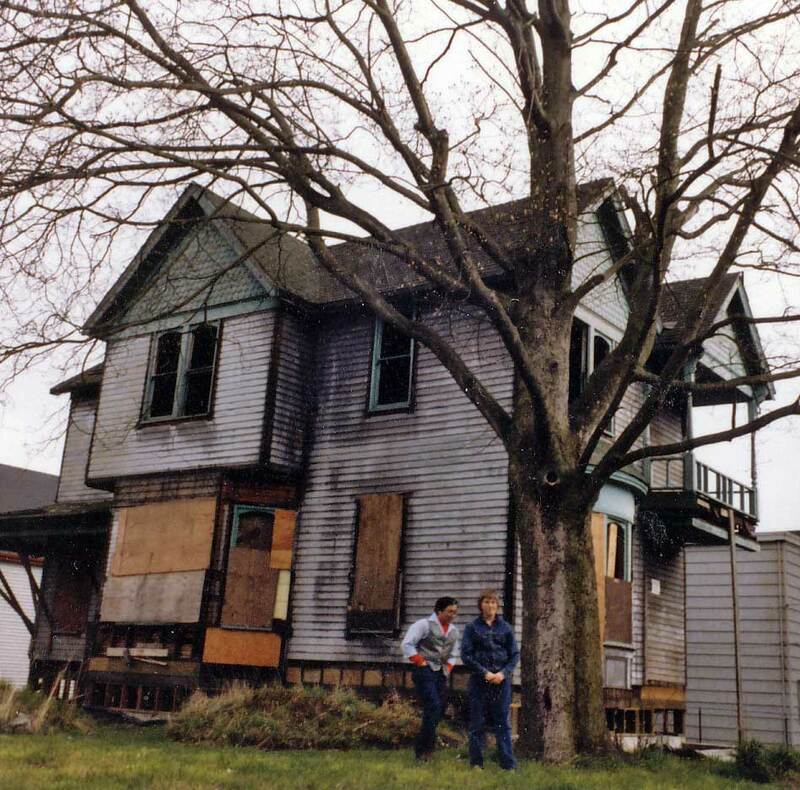 The Brewer House that the Hachiyas purchased in ’85 was a wreck, although a stately one. About four years empty, many of the windows were broken out, clapboards had been stripped from the sides and the interior lathe and plaster walls were so broken that photographs taken from one corner looked through the entire house to the farthest corner. On hearing a skulking crow complain from one of the barren cottonwoods on the lot, a relative visiting during the first winter described it as a “bad omen.” But as Zia explains “I had always wanted a Victorian.” And with Raymond’s help, judicious planning and perseverant searching for authentic materials they got one, both outside and in. The original with caption but pulled long ago from its frame. In 1892 or ‘93 Adora Bell and Louella Mae, two of the Brewer’s nine children, posed on the front porch for this recording of their nearly new Victorian. The timing is derived from the understanding that Louella, the smaller one, was born in the house. 1893 was also the year of the great economic panic, which was followed by a sustained depression. 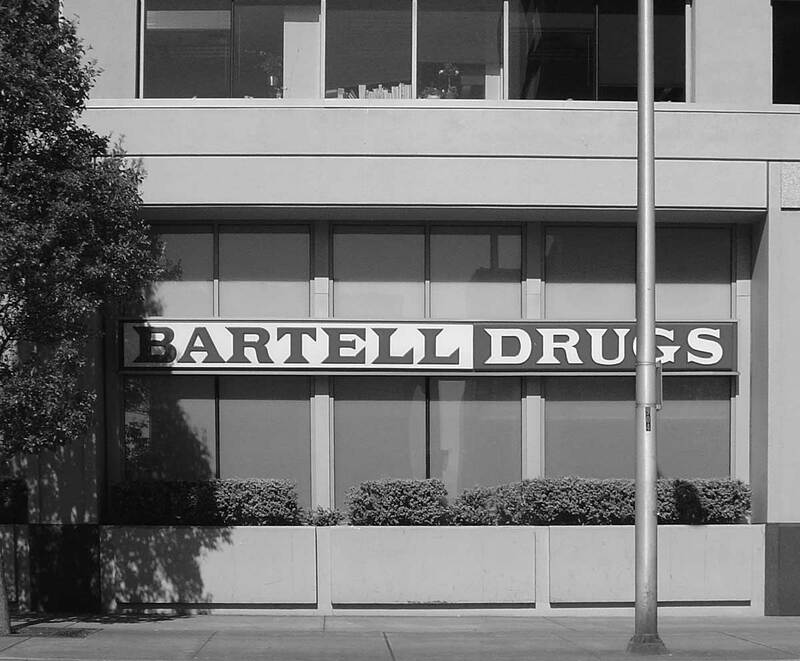 The Brewer’s central district dreams were not so enriching and after ten years they returned to the original Walla Walla. The restored home in sun . . .
. . . and in snow. In the hours left for me before nighty bears* I’ll go fishing for homes – mostly – treated with other Pacific features in the past 29 years. There are a few less than 200, and the ones chosen – about 20 if there is time – will be the ones most readably found. It reminds me of fishing with my dad from a row boat in Lake Newman, a few miles east of Spokane, waiting in a bay for the fish to come to us. We arrived at the moment the state’s fisheries tanker started spouting trout – a restock – into the lake. Within an hour we had two buckets full. There was no limit, except to dad’s conscience. He said, “That’s enough.” We left for home. I was about ten. We shared the trout with neighbors. I confess that I will trust the text as found in the files – I will not change a thing. There will, of course, be plenty of time references that are now long past, but I wont change those either. Real estate pioneer Martin Van Buren Stacy brought an inherited wealth to the cash poor west and bought Seattle land. He also built two mansion-sized homes. Here we see the first of these at 308 Marion Street in 1959 its last full year. Werner Lenggenhager, the photographer, was one of the more prolific of recorders of state landmarks. The year he took this photograph of the brilliantly white La Maison Blanc Restaurant Lenggenhager was awarded the Seattle Historical Society Certificate of Merit. With a few thousand more prints the original survives in the Seattle Public Library. When Martin and Elizabeth Stacy built it in 1885 for a fortune as high as its ornate cupola — $50,000 — their French Third Empire styled mansion was one of Seattle’s three grandest homes. Henry and Sara Yesler and Jim and Agnes McNaught owned the others. The Yeslers and McNaughts generally got along. Martin and Elizabeth did not. In her 1944-45 weekly Times series on Seattle mansions, Margaret Pitcairn Strachan notes that “everyone admits she wore the pants of the family . . . He’d talk and joke and swear a lot – until she showed up. Then he’d never open his mouth.” This may explain why once finished their grand home stood empty until the couple moved in for only a little more than a moment before relocating to a second mansion on First Hill. 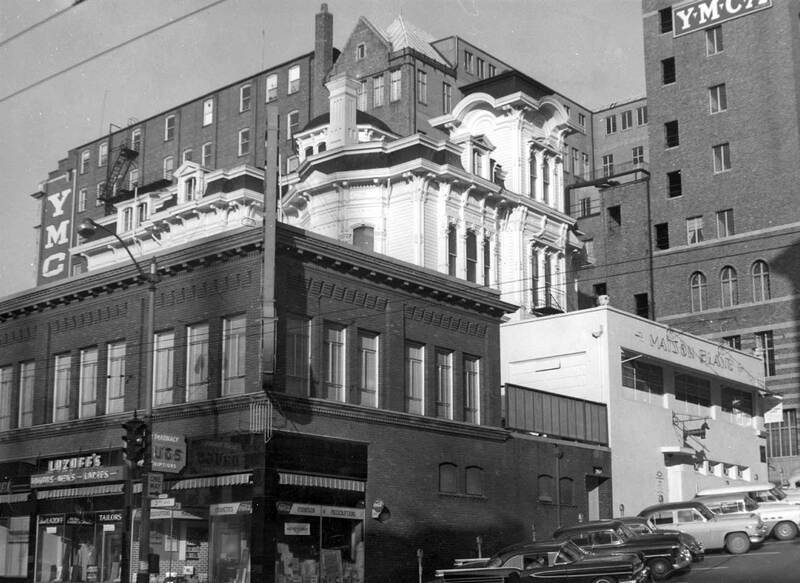 Even then Martin was more likely to stay in a hotel or club than at their new home that later became the University Club which survives at the northeast corner of Madison Street and Boren Avenue. 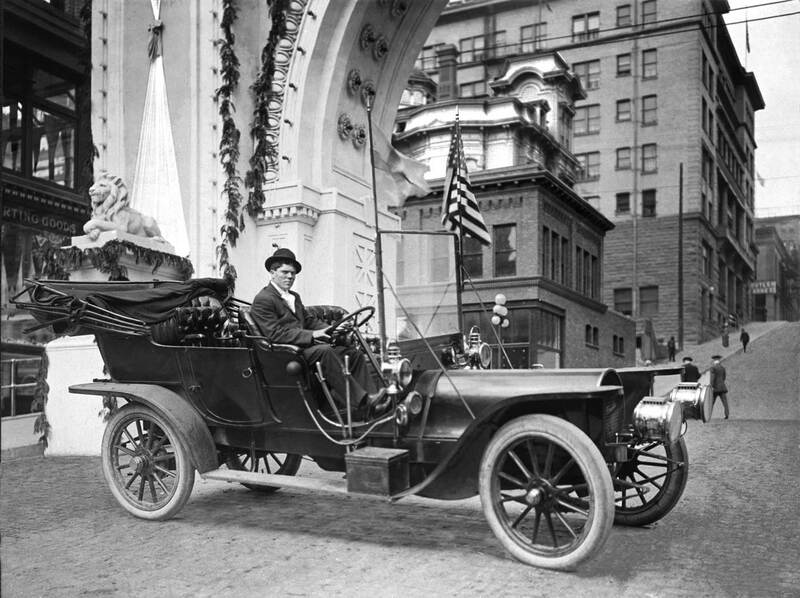 An earlier glimpse of the Stacy Mansion through the Alaska Yukon Pacific arch spanning Marion Street during the 1909 Exposition. 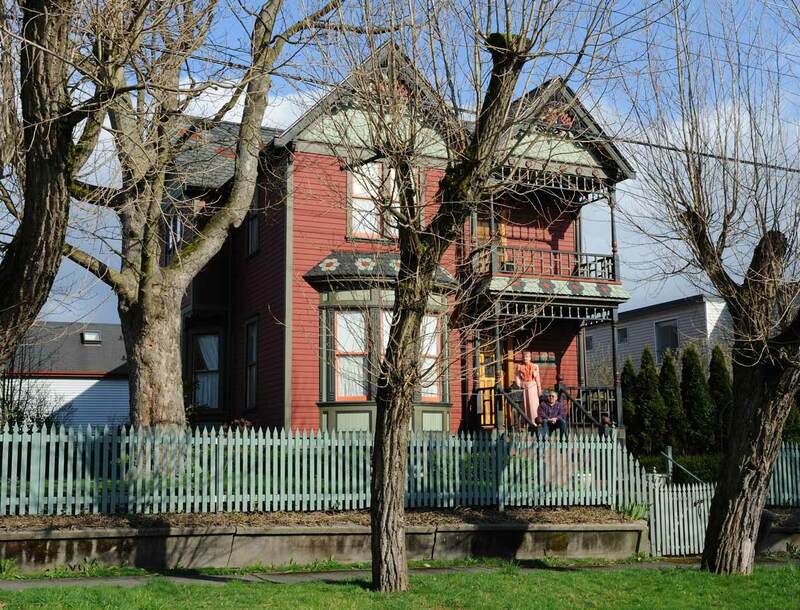 For a brief period beginning in 1890 this Stacy home on Marion was quarters for the Seattle Chamber of Commerce. Next it was converted into what must have been the most sumptuous boarding house in town. But what followed the boarding is what is still remembered by many Pacific Northwest readers. In the mid-1920s Charles Joseph Ernest Blanc turned the mansion into what many considered to be Seattle’s best restaurant. In her 1937 guide “Northwest Novelties” Elisabeth Webb Herrick writes “For the adventurous eater, the menu holds fatal lures. Green turtle steaks, reindeer meat, frogs’ legs, escargots, eels . . . Oh you can have a wonderful time here with a $5.00 bill. Just the two of you.” La Maison Blanc kept dishing out romance and French delicacies until the interior was scorched by fire on April 30, 1960. Within two months it was torn down. This repeat looks north over W. 58th Street (once also known here as Ballard Place) to a mansion whose institutional uses are not obvious because the large rooftop neon sign for the Simpson Bible Institute is seen only on edge from this point of view. 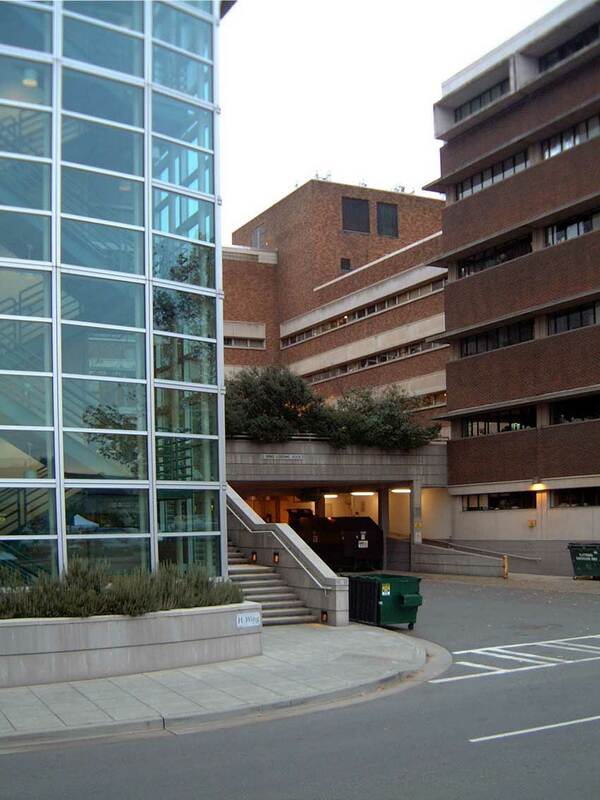 After the bible students moved on to Edmonds in 1977 the site was developed with townhouses. 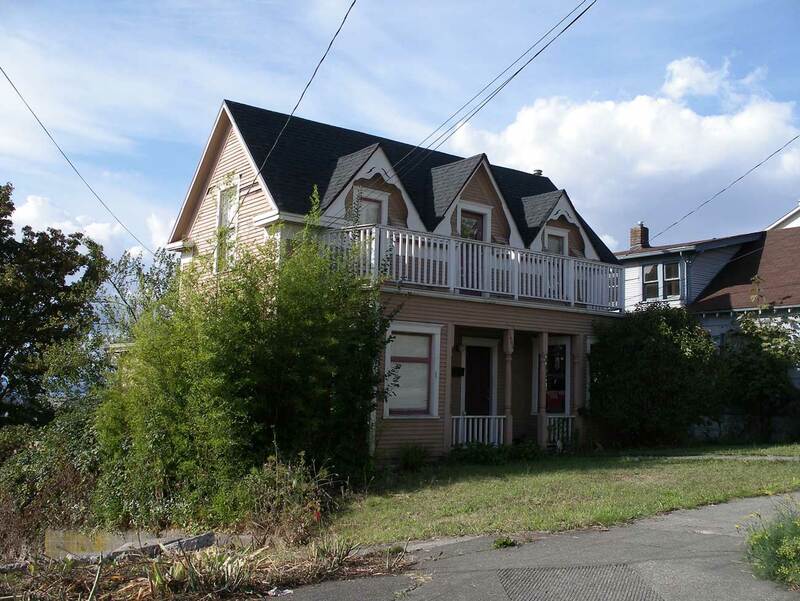 If the King County Assessors form has it right then this oversized home at 101 W. 58th Street (three blocks west of Woodland Park) was built in 1911. 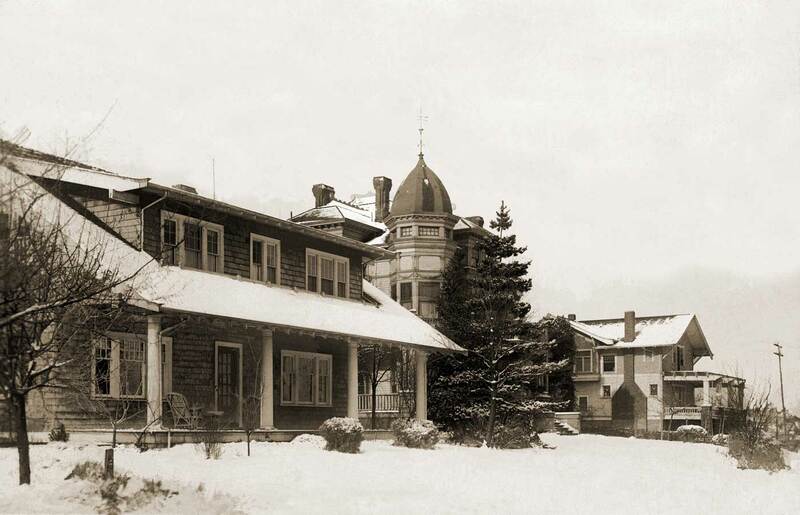 Ten years later the then new Simpson Bible Institute purchased the mansion and its 3-acre lot and built a four story 63-room dormitory behind and below it on one of the steepest parts of Phinney Ridge. While the dormitory was Spartan in the extreme, the mansion with its large covered porch, graceful rooflines and diverse windows retained its external grace. That the inside was carved-up to conform to the needs of the bible college silenced any issue of saving the structure when the college moved out more than a half century later. Judge by its daily schedule school routines were indeed soul searching. Students were awakened at 6:30 a.m. for half hour devotion. Chapel at 8:30, noonday missionary prayers from 11:30 to noon, after supper prayers in the dining room, and meditations from 10:00 to lights out a half hour later, completed an “extra-curricular” schedule that was semi-monastic. The Simpson Institute closed in the mid 1950s but the campus was soon revived with the Puget Sound Bible College. After it too moved out for new quarters in Edmonds in 1977 this oversize triangular lot was converted into modern townhouses. 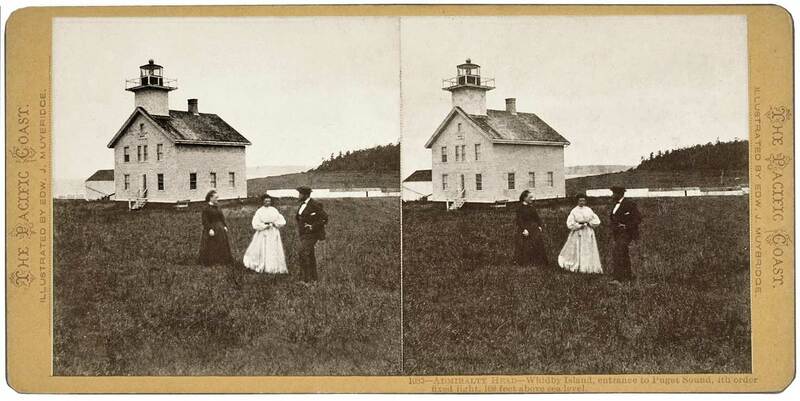 In the spring of 1871 one of the great innovators of pioneer photography traveled the West Coast between Puget Sound and San Diego photographing lighthouses for the U.S. Lighthouse Board at a fee of $20 a day. Born Edward Muggeridge at Kingston-on-Thames in England in 1830 he would become inventive with both his camera and name. By the time the 41 year old visited Whidbey Island and the first lighthouse at Admiralty Head Edward had changed his name to Eadweard Muybridge. Soon after he began his famous motion studies of horses (and much else) running and jumping, experiments paid for by Leland Stanford (of the University). The trio posing for Muybridge is most likely Lighthouse keeper Daniel Pearson, his wife and his daughter Flora who was her father’s assistant. At the time Eadweard was either courting or married to (biographers are not certain which) a different Flora who was half his age and waiting back in San Francisco – sort of. In the fall of 1874 Muybridge shot and killed Flora’s lover, and a jury acquitted him. Flora Pearson loved better. After marrying a Whidbey Island pioneer, and taking a San Francisco honeymoon, she returned to her duties in 1876 – at $625 a year – of assisting her father for two years more until they both retired to a farm with their respective spouses. A reduced mock-up for a page we intended for Jean's and my book "Washington Then and Now." Topped by its red lantern room the two-story frame Admiralty Head Lighthouse with tower first turned on its whale oil fed Fresnel lens on January 21, 1861. After passing the light at Dungeness Spit captains aimed their schooners at the fixed light on Whidbey Island in order to avoid the shallows off Point Hudson. 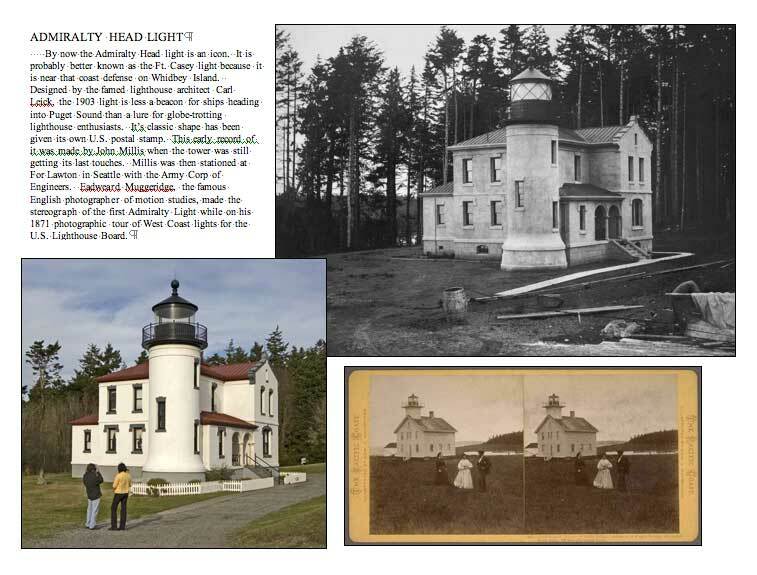 This old light was moved for the construction of Fort Casey and then also replaced in 1903 with the elegantly stucco-covered brick lighthouse that later this month is celebrating its centennial. Designed by famed lighthouse architect Carl Leick the 1903 light is a magnet for lighthouse enthusiasts around the world and appears on a U.S. stamp as well. A great variety of public events are planned for the weekend of the 23rd and 24th – including performances by the Ballard Sedentary Sousa Band and the Straits of Juan De Fuca Barbershop Chorus. 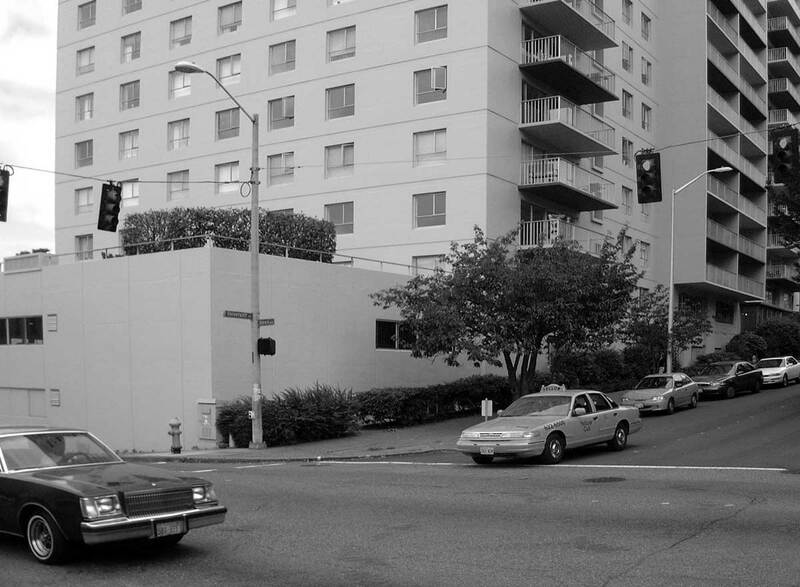 Thanks to a 47 year old tip from Seattle Times writer Alice Staples that may well be Carl A. Peterson at the wheel of the motorcar posing at the northeast corner of University Way and Boren Avenue. Behind the driver and his riders is the brand new oversized home of the banker Manson Backus. Staples wrote a eulogy for the Backus home – and three others shown here – in the spring of 1956 when they were about to be torn down for a modern high rise. She interviewed Peterson. 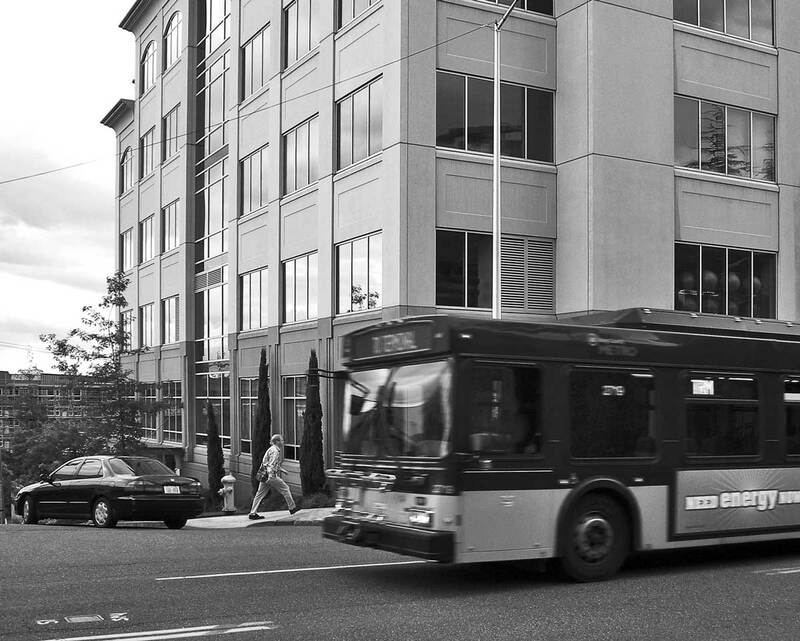 For a half-century C.A.Peterson was a chauffeur of choice on First Hill. He drove for Backus and others and taught many of his employers to drive. He told Staples, “I watched them build this house in 1904.” Manson Backus the Second – the banker’s grandson — described for the reporter the red mahogany living room with a nearly 12 foot wide fireplace, the wide staircase that wound itself to the third floor, and his banker grandfather’s two electrically operated secret panels that he used as safety vaults. 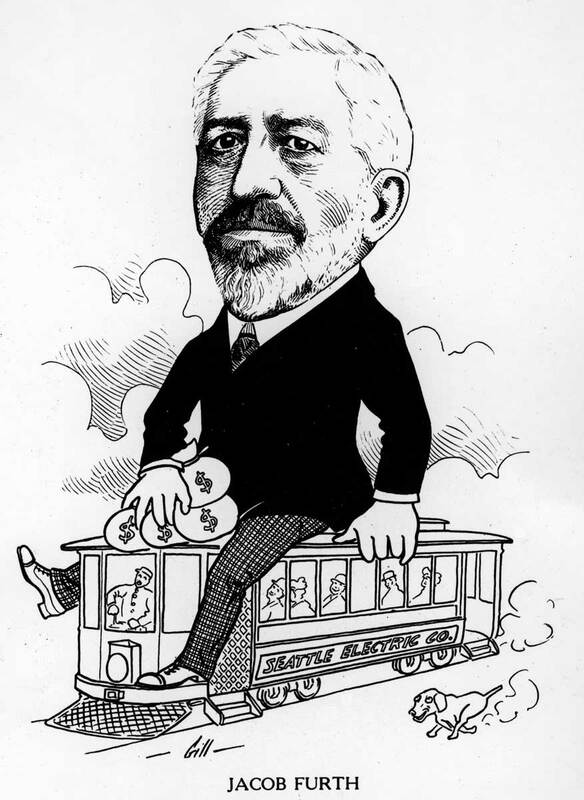 The Mayflower descendent Backus came to Seattle from New York in 1889 with securities already in his pockets and started the (many times renamed) National Bank of Commerce. By the time the bank president moved into this big home he had lost two wives but had two children. His son LeRoy lived with his own family (including Manson the Second) next door on Boren, here to the left. 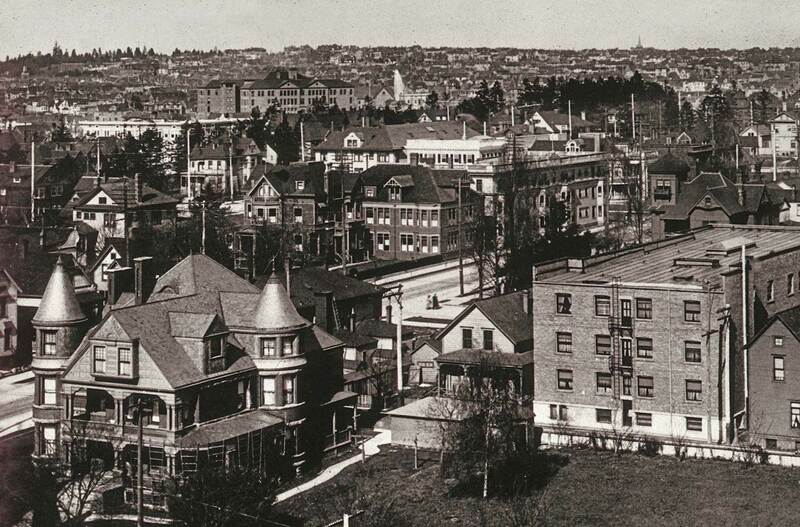 As high-rise apartments first began to replace the mansions on First Hill many of its established families – Backus included – uprooted to the Highlands. The home's condition before the work of restoration. 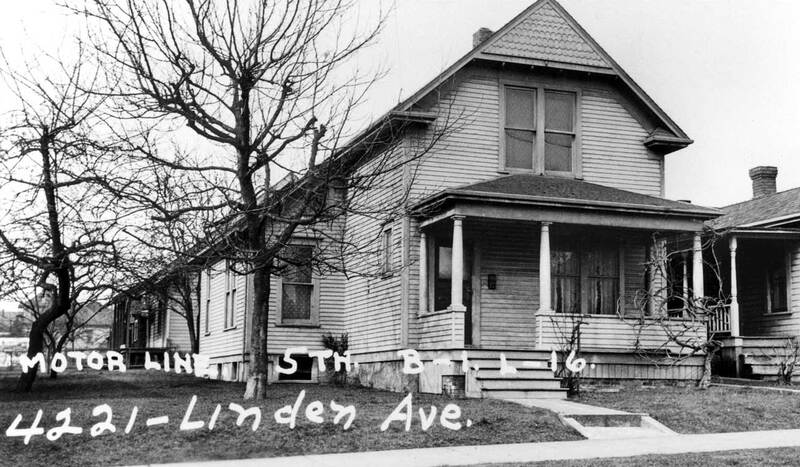 When the first owner, a plasterer named Alfred Bartlett, moved into 4221 Linden Avenue in 1904 it was a modest clapboard distinguished by decorative gables with brackets, ornamental fish-scale shingles, old-growth porch columns, double-hung windows with crowns. When Heather and her husband Shawn purchased the home in 1998 it was sans everything – except the clapboards. For a half century they hid beneath clumsy rows of oversized cedar shakes. Most distressing, the original windows had been replaced by sliding aluminum ones. Even before they moved in Heather McAuliffe announced, “Those windows have to go or I’m not living here.” And now five years later gone they are, and the siding too. Like many other King Country residents McAuliffe consulted a WPA tax photo of her home for a look at what had been destroyed or hidden since the late 1930s. She took the additional step of religiously restoring it. For this feature readers may wish to turn the magazine upside down for a conventional introduction to the eccentric subject of the House Upside Down. Next return Pacific to its proper posture and note the gigantic piano on the far right. 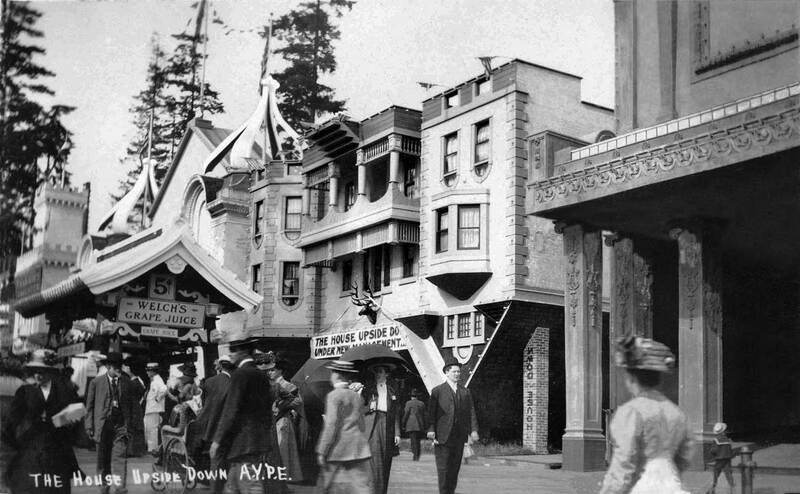 The Pianotorium and the House Upside Down (HUD) are two of the thirty odd amusements erected along The South Pay Streak of the Alaska Yukon and Pacific Exhibition (AYP) held on the University of Washington campus through the warmer months of 1909. 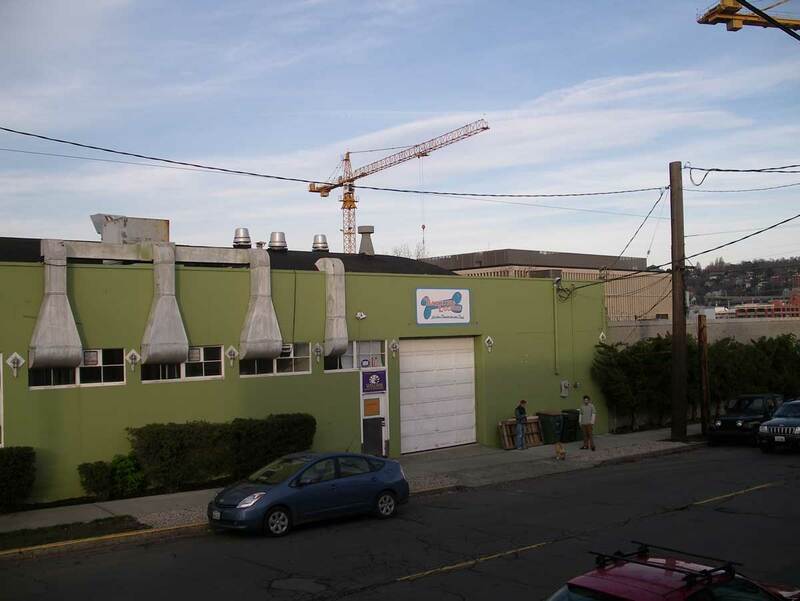 These two architectural grotesqueries were propped midway between what is now the Burke Gilman trail and Portage Bay in line with Stevens Way – if it ran this way through the south campus, which is does not. This snapshot and these quotes all come from Dan Kerlee, the local AYP scholar-collector. Kerlee discovered that by the time Roltair came to Seattle he and his HUD were old fair attractions. In 1901 for the Pan American Expo at Buffalo, Roltair erected a HUD that aside from a few ornaments was the same as this one on the carnival midway of the AYP. Some readers may remember the once popular “progressive dinners” in which, say, the eager and eligible members of a church’s youth league would pile into cars and drive from host to host consuming a new course at each stop. 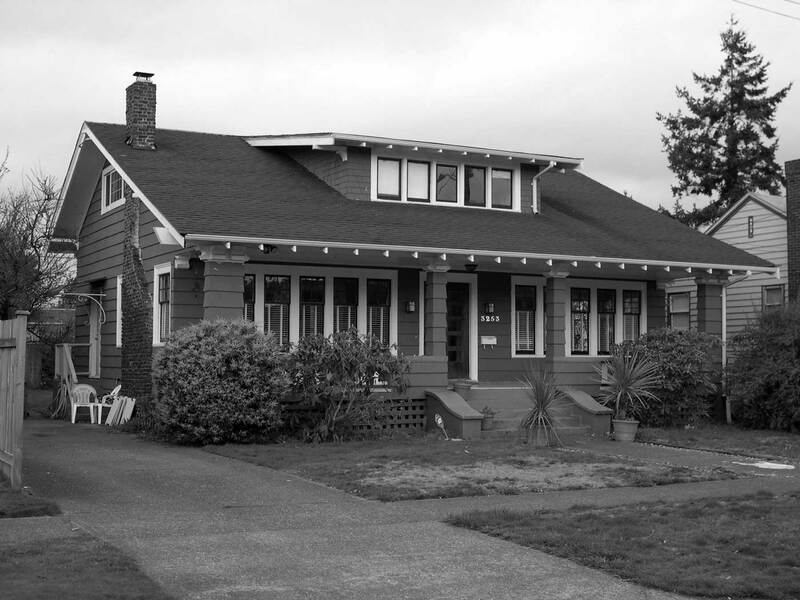 This coming Saturday June the 5th from 10:00 am to 4:00 pm the Southwest Seattle Historical Society (SWSHS) will run its 10th annual Homes With History Tour. (This is dated by more than five years.) Here, of course, it is not potato soup or marshmallow Jell-O that is gobbled but heritage, architecture and something that the cliché “life style” seems to keep covering. There are nine stops in the Saturday tour and since the Southwest Seattle is far flung you will want to drive. The historical society provides the list of sites, an open door to each and hosts that “interpret” the several landmarks and answer questions. This Craftsman bungalow at 3253 62nd Ave. SW is one of the stops for the sufficient reasons that it is a fine example of one of the region’s most popular home styles and that the present owner is willing to share her delight in its typical and sturdy qualities. Built in 1907, this is an old bungalow. The historical photo dates from 1937 when catalogers were beginning to gather names for the 1938 Polk City Directory, which lists Fred and Esther Wheeler living here. Perhaps those are the Wheeler kids on the front steps. Fred worked as a laborer for the city’s department of engineering. Wages were low, living was often a pinch and the Wheelers were renters. This year the tour stretches “domesticity” by including the Log House Museum, the newly renovated West Seattle Carnegie Library, the century old Homestead Restaurant (would that the home tour were also a progressive dinner!) and the Alki Point Light House. Since 9/11 this last has been harder to visit so here is your chance to visit the light that is about four years younger than the bungalow. These annual tours are also fund-raisers for the Southwest Seattle Historical Society but the modest fee is well spent. Of course, you are encouraged to fill your car with family and/or friends that share your interest in community history and appreciate the open arms that will greet you at each place along the way. You may wish to call (206) 938-5293 for details or contact the society. When new in 1891 Dora and Otto Ranke’s First Hill home was appropriately baronial for a family of six and one of the Seattle’s most prosperous pioneer contractors. The mansion was lavishly appointed with carved hardwoods, painted tiles, stained glass, and deep Persian rugs. On the first landing of the grand stairway was a conservatory of exotic plants including oversize palms that grew to envelope the place. Also inside were the family’s famous traditions of performance and fun. The Rankes were married in Germany and immigrated together. Dora was a dancer and Otto a tenor. Together they supported and performed in the local productions of Gilbert and Sullivan’s comic operas. The couple also helped found the Seattle Juvenile Opera Company giving it rehearsal space in their home and instructions from an imported coach. Most of the Ranke’s playful life was centered in their home at Fifth and Pike. Otto had little time to enjoy this their third Seattle home. He died in 1892. The family stayed on until1901 when the house was sold to Moritz Thomsen. 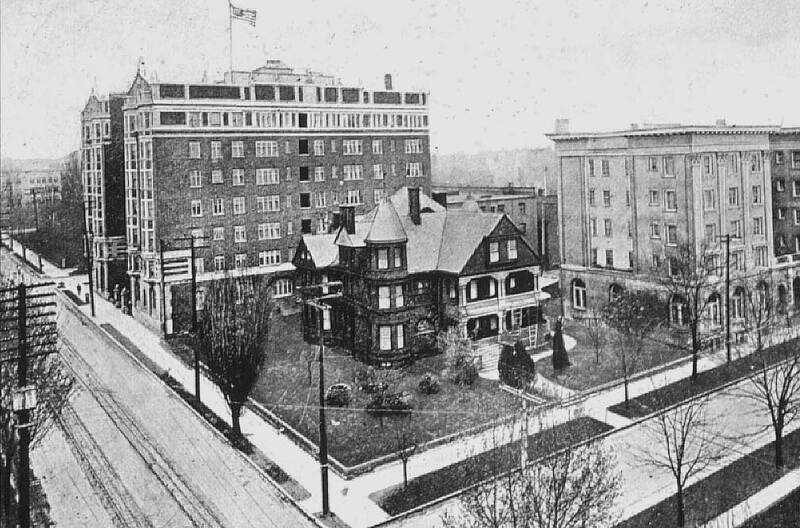 The last occupants were student nurses training at Columbus Hospital that much earlier had been converted from what was originally the Perry Apartments, the large structure seen directly behind the Ranke Mansion. 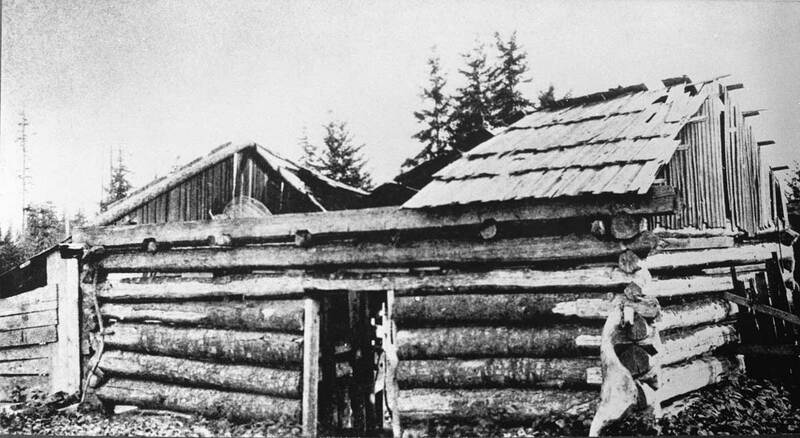 Whatever its name or primacy the Alki cabin in this photograph was razed in the fall of 1892. The photograph is not dated. Its site may have been lost as well – temporarily. 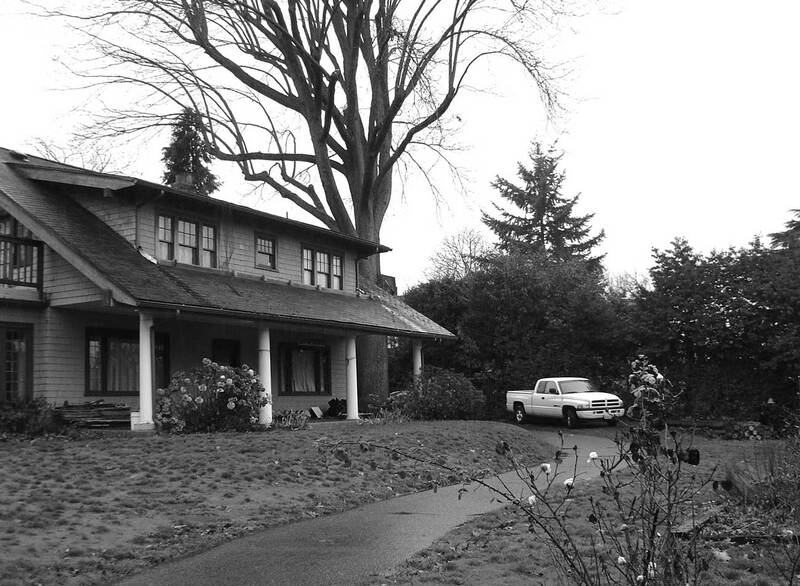 The contemporary photograph looks towards the corner of Alki Avenue and 63rd Avenue S.W., the original location of the Founder’s pylon that commemorates the builders of this log cabin. (The pylon has long since been moved across Alki Avenue.) Historical photo courtesy of Seattle Public Library. Our punning headline plays with the uncertainty about this celebrated photograph. Is this the Denny Cabin or the Low Cabin? To add to the confusion, for reasons that still grieve John and Lydia Low’s descendants, the Low Cabin is most often called the Denny Cabin? 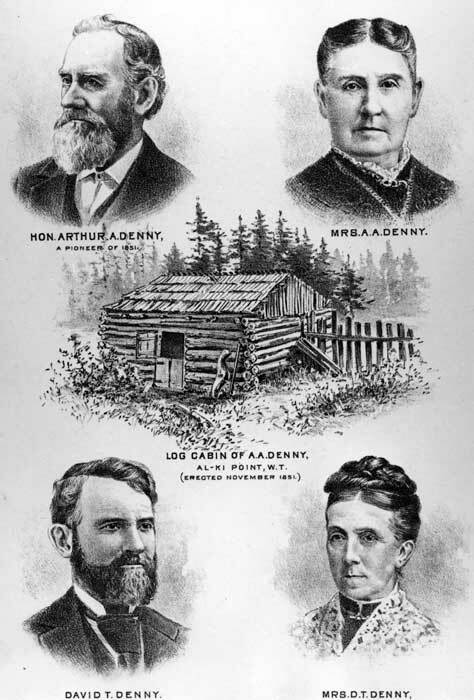 While building a second cabin – the Denny Cabin – the dampened settlers crammed into the Low Cabin. 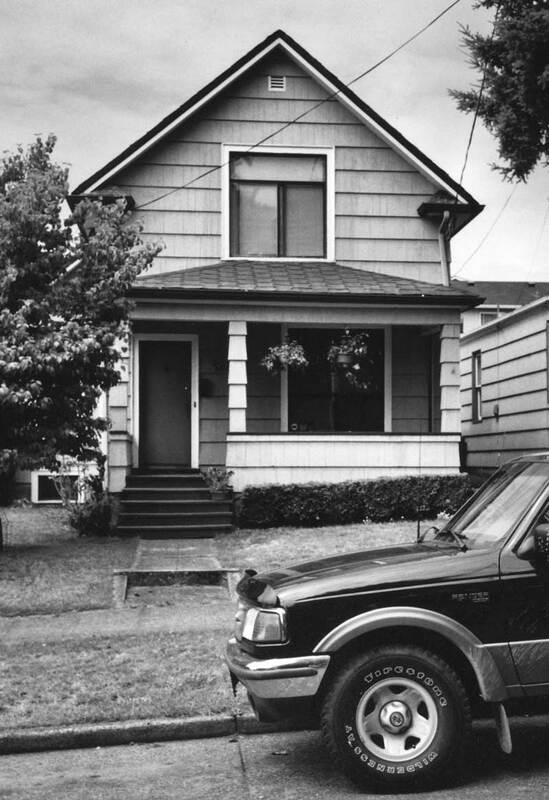 So the Low Cabin was first cabin, but in practically every printing of this photograph the structure is described, in some variation n, as “The Denny Cabin, the settler’s first home on Alki.” I think it is the Low Cabin. 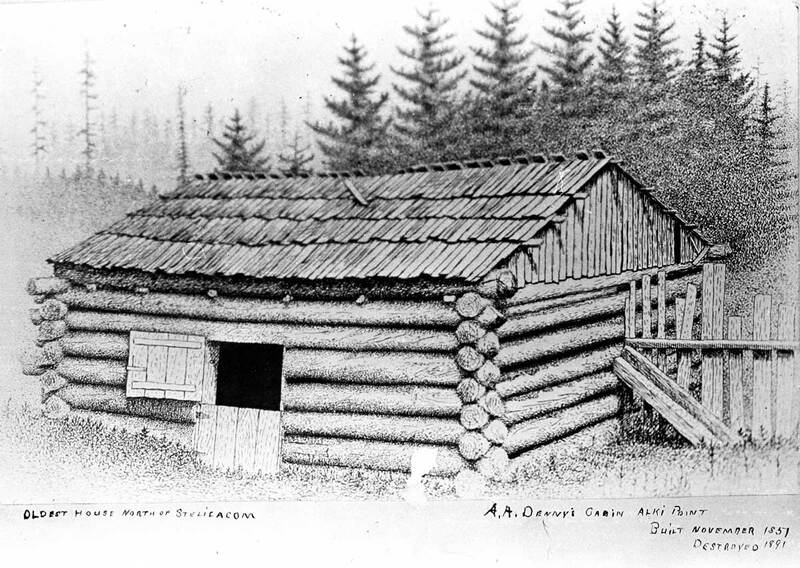 Greg Lange, of the Washington State Archive, thinks it is the Denny Cabin – or the second cabin. From 1894 to their deaths in 1928 Henry and Kate Holmes raised their family in the ornate Victorian mansion seen here in part at the center of the historical scene. The residence in the foreground that survives in the “now” view was for many years the home of one of the Holmes daughters; Ruth Huntoon and her lawyer husband Richard. 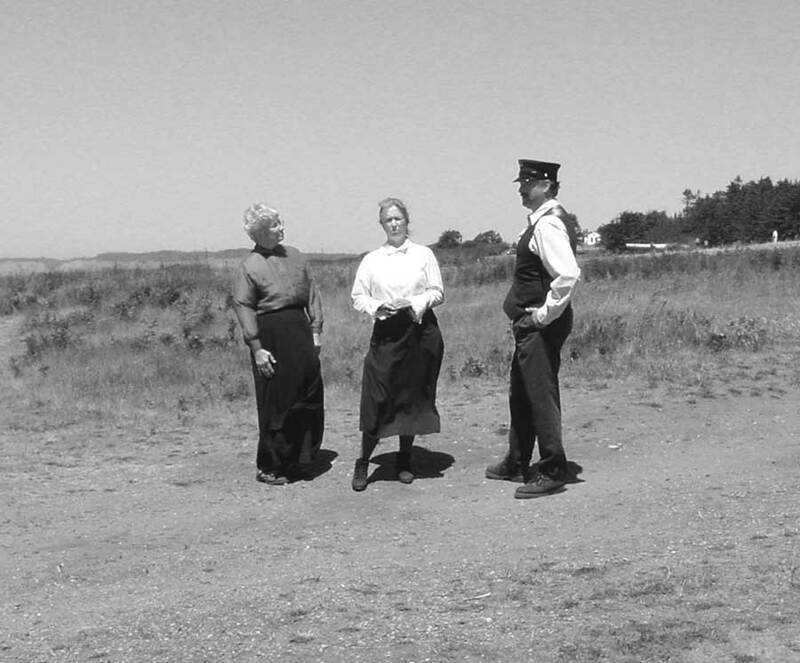 The historical photo is used courtesy of their grandson, also an attorney, Peter Buck. 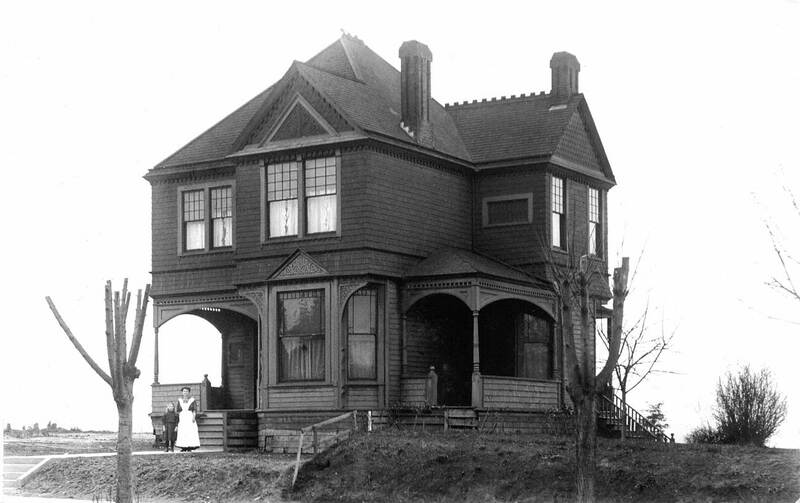 In 1894 the retail-wholesale druggist Henry and his wife Kate Holmes followed the increasingly fashionable move to the ridge overlooking Lake Washington. 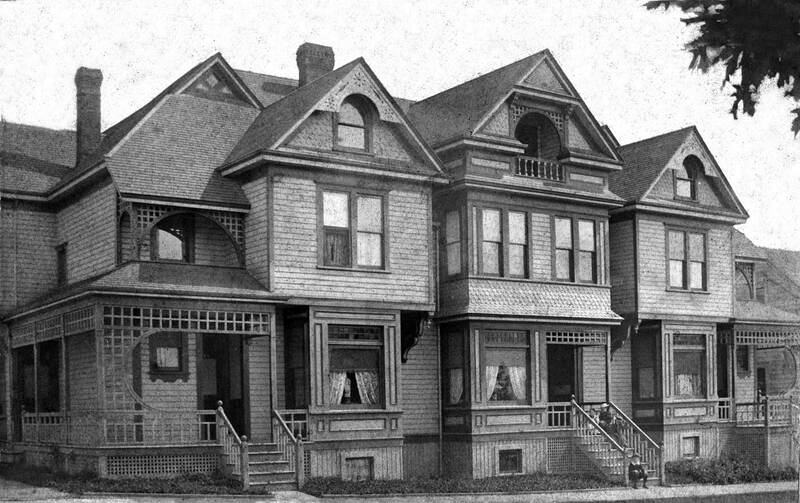 Their grand home was three houses north of Jackson Street on 30th Avenue S and consequently conveniently close to the Yesler Way Cable Railway. 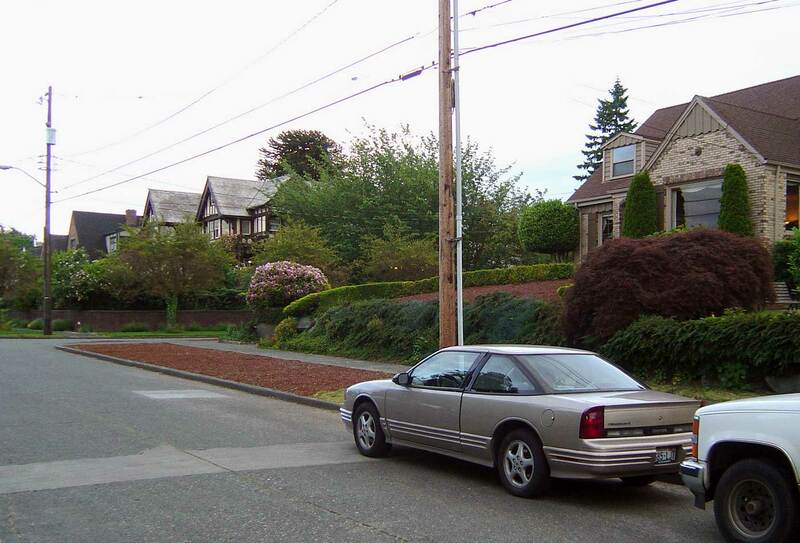 When the Holmes moved in the Leschi neighborhood was already clear-cut and the view east unimpeded. Now the lofty greenbelt of Frink Park partially obscures it. From whomever the couple bought the well detailed and mansion-sized Victorian – (the tower rises here at the center of the scene) they may have got it at a good price from an owner injured by the nation-wide financial crash of the year before. And the purchase may have also been speculative for it was expected by many of their neighbors that one day the ridge would be lined with hotels and apartments. But the Holmes stayed put and raised a family of fours daughters and a son. As each grew to maturity they stayed on the block building homes beside their parents and creating thereby a kind of Holmes family compound. The larger modern bungalow in the foreground was built in 1910 (if you believe the tax records) for Ruth Holmes Huntoon and her lawyer husband Richard W. Huntoon, and they lived there for many decades. After the druggist and his wife both died in 1928 none of their children wanted to live in the ornate mansion of high ceilings and winter drafts. So it was razed in 1929. 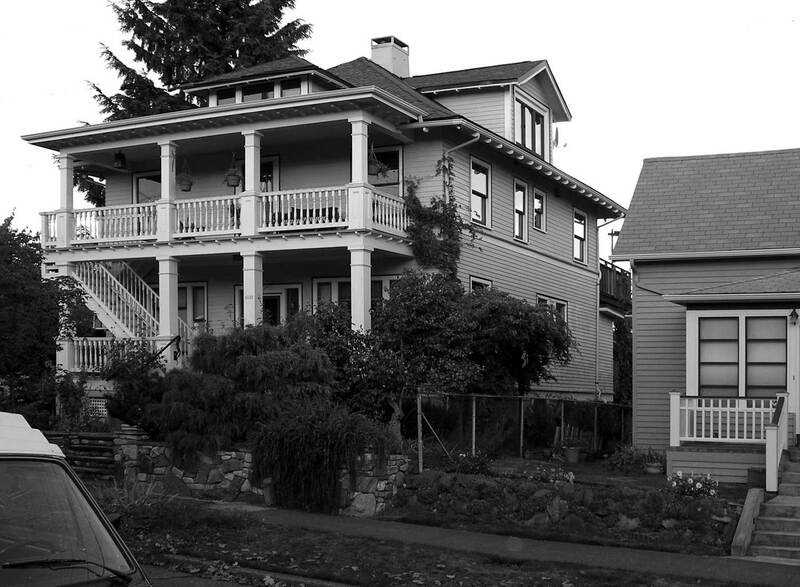 A stand alone showing of the old Holmes home is featured on page 116 of “Leschi Snaps”, the third of Wade Vaughn’s books on the neighborhood. Of the three, this photo essay is the best evocation of Vaughn’s sensitive eye for his surrounds and like the first two it can only be purchased at the Leschi Food Mart. The proceeds all go to the Leschi Public Grade School Children’s Choir. 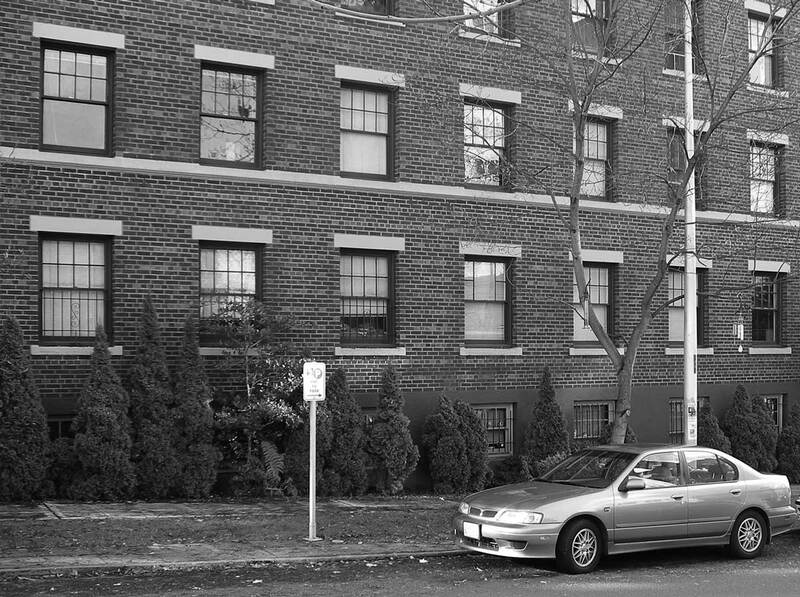 While the historical photograph is neither dated nor are it posers named, the home is identified as the last of the Bell residents in Belltown. A likely date is the mid-1880s. 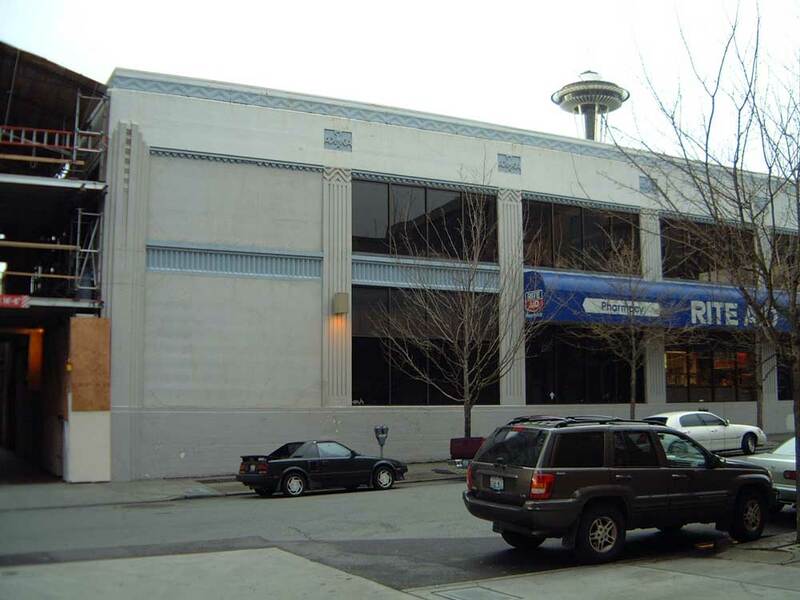 Like the Parking lot that replaced it, the Bell home faced First Avenue between Bell and Battery Streets and so in the heart of Belltown. Historical pix courtesy Museum of History and Industry. This is the last of the Bell family homes in Belltown. It faced First Avenue from its east side about mid-block between Bell and Battery Streets. Counting a temporary home near Pioneer Square this is the fourth Bell home. The family moved both around and away. During the Indian war of 1855-56 the Bells sensibly fled their first finished home to Seattle for protection. That home overlooked Elliott Bay from the low bluff that was nearly two blocks west of this home on First. It was torched during the “Battle of Seattle’ and the fire could be seen from the navy gunboat Decatur that protected the village. After the battle the Bells left for California. Later William returned with his son and several daughters to develop their 320 acres into Belltown. His wife had died in California. It seems that William Bell moved into this his last home in 1875 with his third wife Lucy, who was the sister of his first wife. William died in the fall of 1887 although he’d been an invalid for six years previous. So if those are Bells posing that is most likely William’s only son Austin posing with his wife Eva and three sisters. Austin was gregarious, well liked and loved and to quote Edward Arlington Robinson’s famous poem, he was also “imperially slim . . .a gentleman from sole to crown . . . always human when he talked . . . he was rich . . .he was everything.” But also like Richard Cory he “put a bullet through his head.” The son thought he recognized his father’s dementia in himself and explained to his wife with a shaky note that life with such poor health was not worth living. Austin shot himself in the right temple on April 24, 1889. The day before he was out with a nephew cheerfully describing the brick business block he was planning near the family home. The structure was built by his widow and named by her the Austin A. Bell building. The ornate front façade was landmarked and it survives facing First Avenue. The Hainsworth home in West Seattle on 46th Avenue SW north of Massachusetts Street is certainly one of the oldest residents in Seattle. Although it has been added onto over the years the home is still distinguished and very fit. Richard and Holly Grambihler, the present owners, are pleased to point out how the strange variation in the number of panes in the two front second floor bedroom windows survives. On the left the pattern is four up and four wide. On the right it is four up and three wide. Such are the pleasures of preservation. 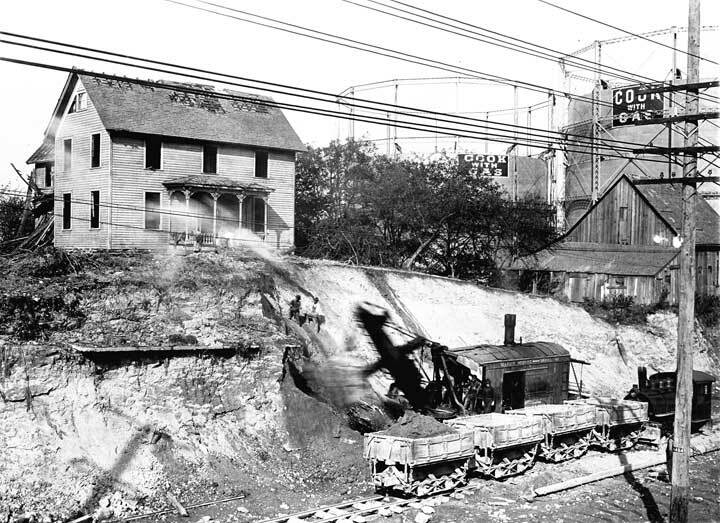 Historical photo courtesy Southwest Seattle Historical Society and Log House Museum. This week and next we’ll feature two William Hainsworth homes. Here is William Henry Hainsworth II Victorian mans on 46th Avenue Northwest overlooking Puget Sound and the Olympics. Next it will be “William the Third’s” home on S.W. Olga Street overlooking Elliott Bay and Seattle. 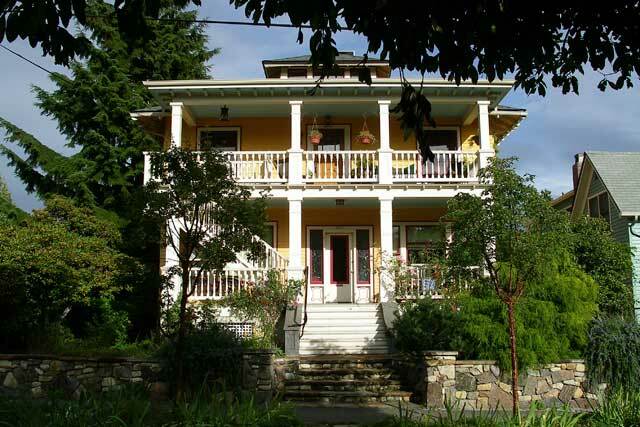 Both distinguished residences survive up on the West Seattle plateau although their neighborhoods are separated by one of the most enchanted and yet hidden natural features of Seattle, the deep and long Fairmount Ravine. William and Mary Hainsworth, their daughter Betsy and two sons Will III and John moved to the West Seattle plateau in 1889 when, according to the recollection of Will III’s brother in law Arthur Stretch, it was still “covered with second-growth timber and brush.” Both the Stretch and Hainsworth families lived on what the West Seattle Land and Improvement Company named Columbia Street — Arthur Stretch’s father Richard was the engineer who laid it out. The name was changed to 46th when West Seattle was annexed into Seattle in 1907. The fathers of both families – William II and Richard – were English immigrants and by Arthur’s accounting their’s were the first two families to settle there. They and their families were very close with Will III marrying Arthur’s sister Florence. The 57-year-old Will II moved to West Seattle directly from Pittsburg where he had considerable success building a steel foundry when still in his late thirties. Family tradition, at least, has Andrew Carnegie advising him to stay in Pennsylvania but Hainsworth declined and opened a new foundry in Ballard. It might have taken a while then to get between Ballard and West Seattle but not forever. The San Francisco based developers that promoted the West Seattle plateau outfitted it with cable cars and an 8-minute ferry ride to Seattle. This may not be the earliest photograph of the Hainsworth home. Another appears in Chapter Three of the West Side Story (page 28) where there is much more about the two families and the early years of life on the plateau. Apparently when the Hainsworth home on Olga Street was built in 1907 the streets were still only lines on the plat map. The contemporary view looks southwest along 37th Avenue SW. It was taken a stones throw (to the rear) from the Belvedere Viewpoint on SW Admiral Way. Historical View Courtesy of West Seattle’s Log House Museum. 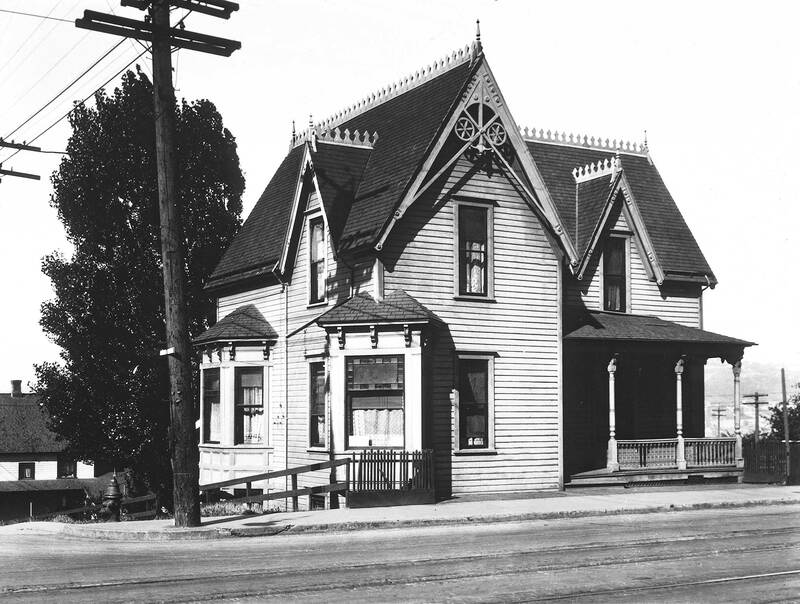 Last week we featured an early view of William Hainsworth Senior’s West Seattle home on 46th Avenue S.W. 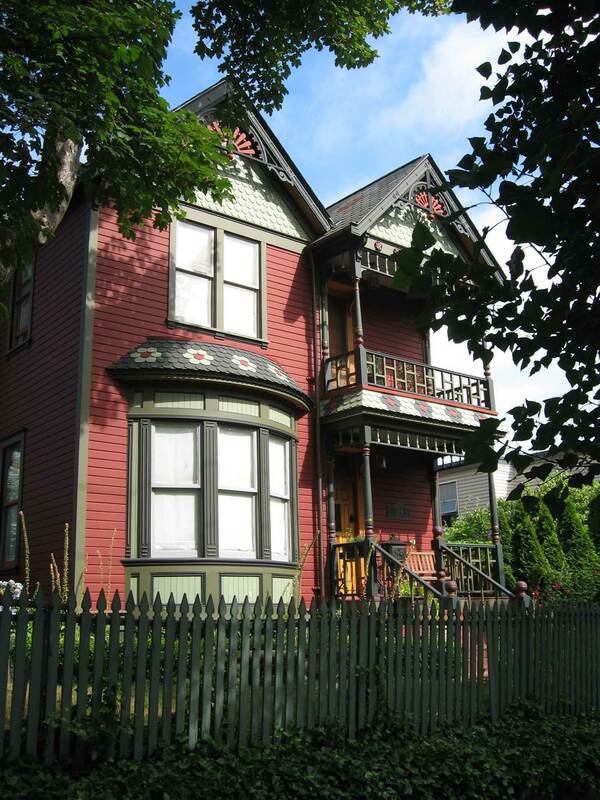 Built in 1889 it was one of the first two residences on the West Seattle plateau and it survives. True to our promise then here is the English Manor Manse of William Jr and Florence Hainsworth. Florence’s maiden name was Stretch, and with the Hainsworths the Stretches was the other of the first two families. They also lived on 46th. 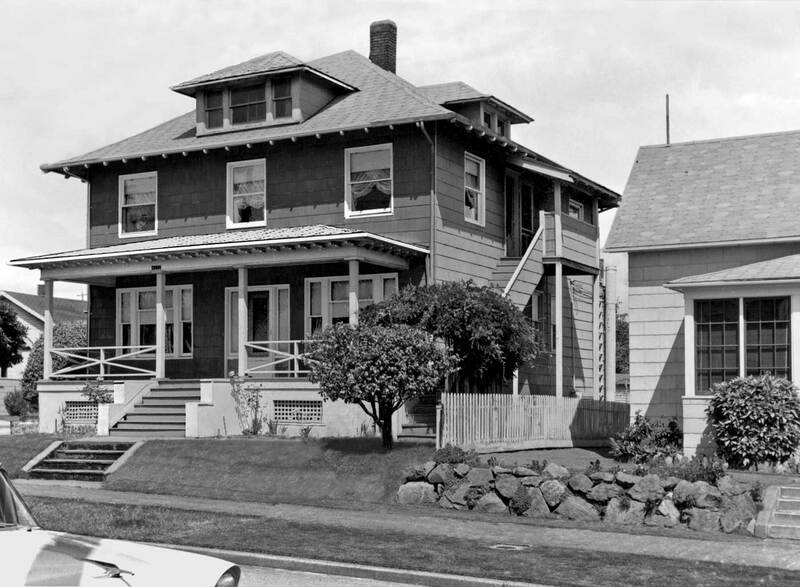 When the couple’s grand home was built in 1907 at the southwest corner of SW Olga Street and 37th Ave. SW it was still a different neighborhood from that of the older homes on 46th overlooking Alki Beach. 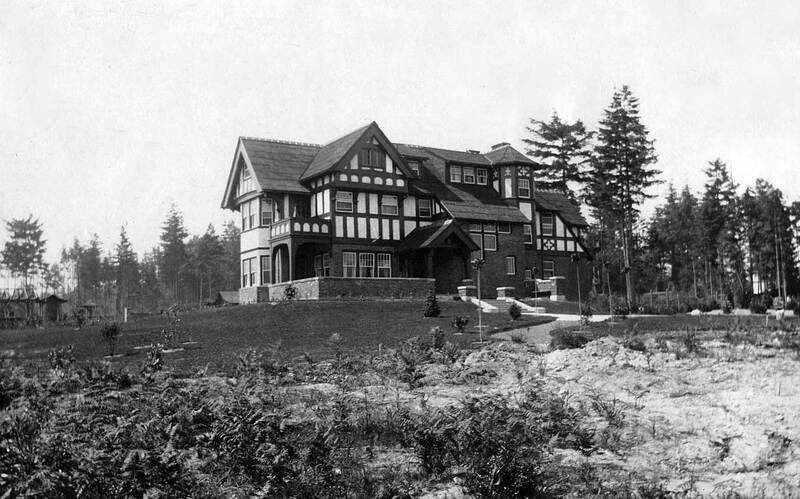 The new mansion was sited so that it could look directly over Elliott Bay to the Seattle waterfront. In visiting the old homes from the new the couple could not at first easily follow the crow for although there were probably plenty of crows in the deep Fairmount Ravine there was no substantial bridge over it. The Hainsworths were leaders in getting the bridge built. When Florence’s brother Arthur returned from the Yukon Gold Rush in 1899 he and his brother-in-law William Jr. opened the Coney Island Baths, one of the first on Alki Beach. While Arthur had been digging in Alaska William had been playing it careful with real estate in West Seattle and obviously doing very well at it. 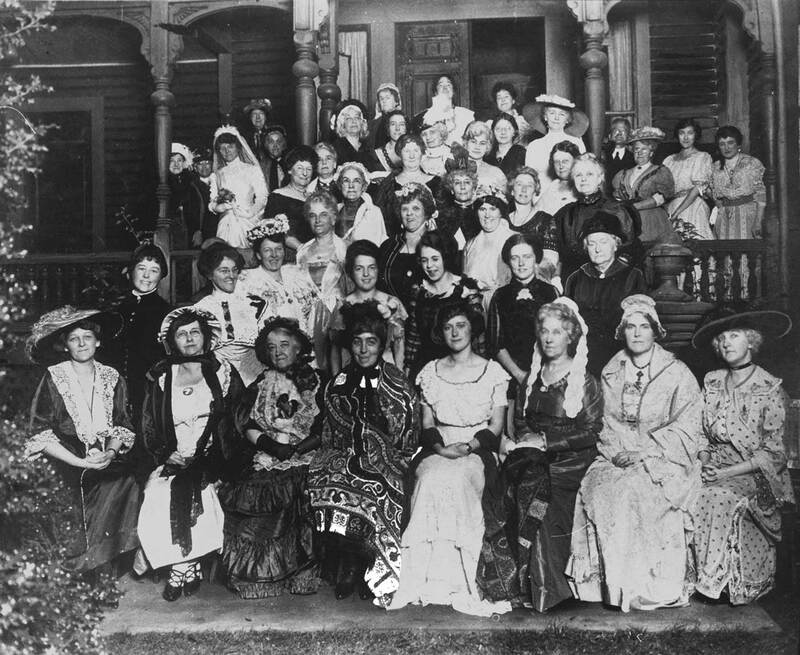 Early members of the Seattle Historical Society pose on the front stairway to the Carkeek mansion at the southwest corner of Boren Avenue and Madison Street. The group portrait reminds us that it was once the practice for almost any group interested in culture – the arts, heritage, and philanthropy – to have been founded, attended, and run by women. Historical photo courtesy Lawton Gowey. Except for one man – and can you find him? 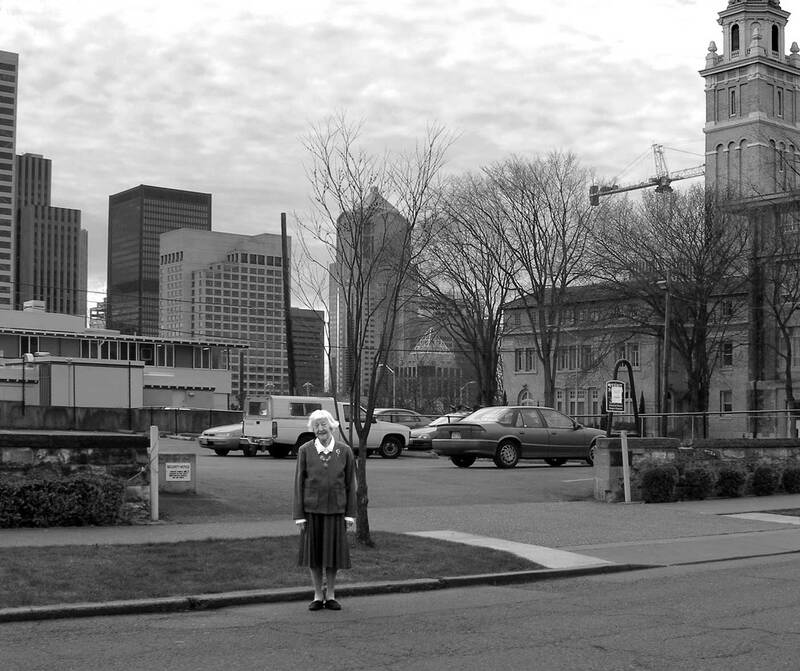 – none of the costumed members of the Seattle Historical Society posing here is wearing pants. (That little man in the upper-right corner seems to have snuck into the scene.) 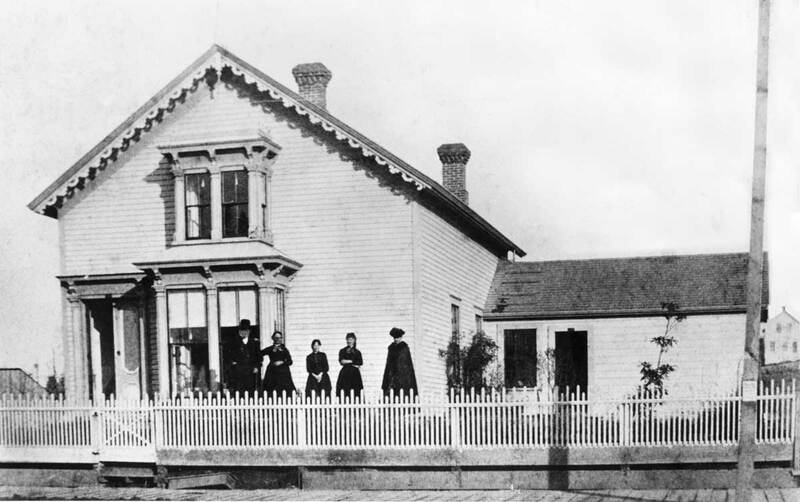 The front porch of the Emily and Morgan Carkeek First Hill home at Boren and Madison was used more than once for such a group portrait. The Carkeeks where English immigrants and their children Guendolen and Vivian kept the family’s Anglo-Saxon flame lit. More than a student of the King Arthur legend, the lawyer Vivian Carkeek was a true believer and for years the national president of the Knights of the Round Table. The daughter Guendolen was packed off to England as a teenager for an English education, although she wound up living in Paris and marrying a Russian count. Later she returned to Seattle to help revive the historical society that her mother founded in 1911. A few of these period costumes are very likely still part of the Society’s collection at the Museum of History and Industry. Although early, this is not the first costume party. That was held on Founders Day, Nov. 13, 1914 and there survives a different group portrait from that occasion. This is probably soon after. But who are these early leaders in the celebration and study of local heritage? The only face familiar to me here (from other photographs) is that of Emily Carkeek herself. She looks straight into the camera at the center of the fourth row down from the top. Two rows behind her and also at the center, the woman with the large while plume in her hat resembles the artist Harriet Foster Beecher, but it is almost certainly not she. On March 30, 1915, Harriet Beecher along with the historian-journalist Thomas W. Prosch, pioneer Margaret Lenora (Lenora Street) Denny and Virginia McCarver Prosch all drowned when the Carkeek’s Pierce-Arrow touring car crashed off the Riverton Bridge into the Duwamish River. Only the chauffeur and Emily Carkeek survived. Both Virginia Prosch and Margaret Denny were involved either as officers or trustees of the historical society and neither of them appears in this cheerful group portrait. 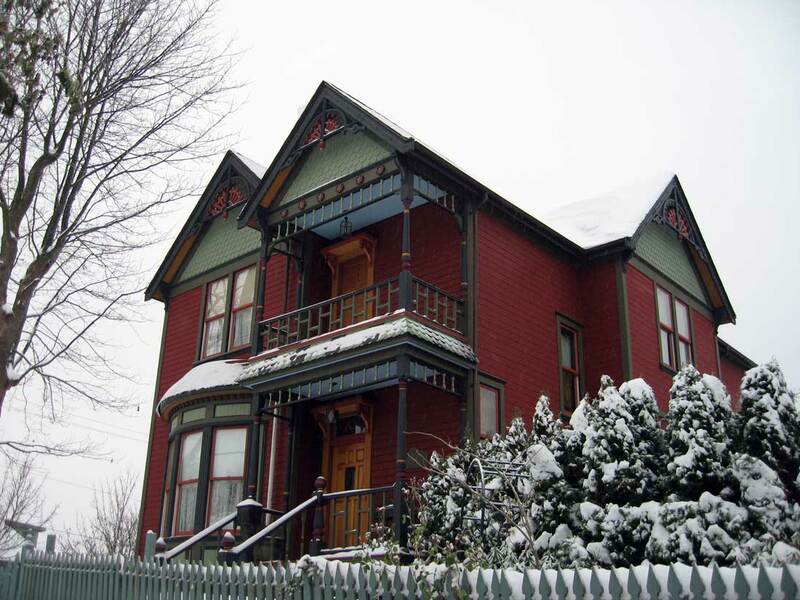 The triplex at Spring and Boren is an example of the distinguished and yet affordable Victorian housing that was typical of Seattle during its boom decades between 1880 and 1910. Although both sturdy and stately many of these structures were short-lived, replaced with larger brick structures like the apartment house that took the place of 1017, 1019 and 1021 Spring Street. Historical photo courtesy of John E. Kelly III. Taking the Northern Pacific Route in only its tenth year as a transcontinental, the Kellys moved here from Waterford, New York in 1893 — just in time for the national depression of that year. Still the Kelly’s continued to prosper and multiply with John Senior opening a popular dry goods store downtown. And John Jr. soon rose from these steps on Spring Street to nurture a Seattle career as an architect. Next the architect’s son John E. Kelly III continued the family’s talent for professional handiwork with a long career as a naval architect, and a valued activist for heritage with the Sea Scouts, the Puget Sound Maritime Historical Society, the Southwest Seattle Historical Society and, thankfully, Kelly-Gailey family history as well. John “the third’s” mother Eileen, was the daughter of another First Hill household, the David and Elisabeth Gailey family. While Eileen was attending Broadway High School the Gailey’s bought a hotel, the Knickerbocker at 7th and Madison, and moved in. The maturing Eileen’s creative calendar included piano lessons with Nellie Cornish and courtship with John E. Kelly Jr. the lad on the steps. It was during their dating that the couple shared a moment of unforseen amusement – a brush of domestic kismet — when they determined that four years after the Kelly family moved out of 1019 Spring Street in 1896 the Gaileys moved in and kept it for eleven years before they left to care for their big hotel. Then and Now Caption together. 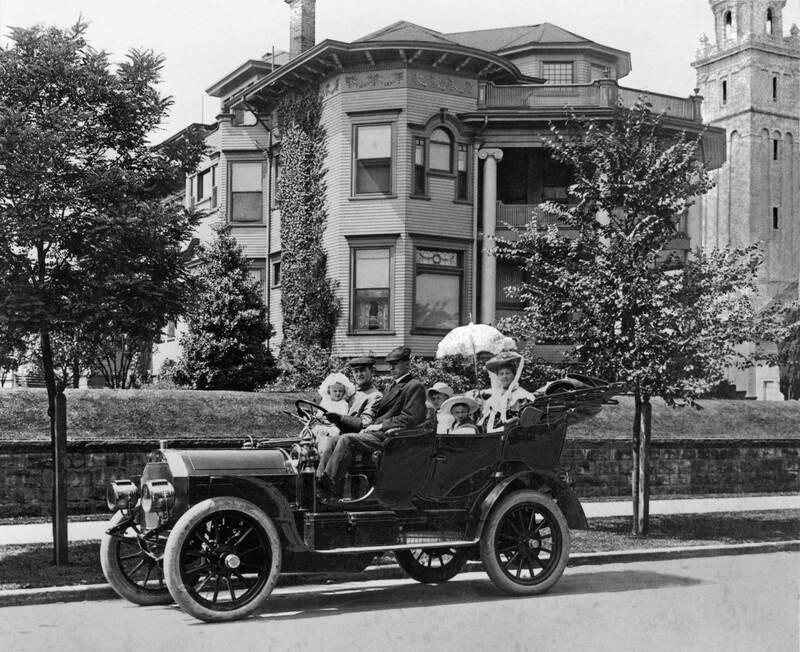 When Norval Latimer (in the front seat) married Margaret Moore (in the back seat) in 1890 he was the manager of the pioneer Dexter Horton bank. When they posed with three of their children for this 1907 view on Terry Street with the family home behind them, Norval was still managing the bank and would soon be made both president and director as well. Contemporary photo by Sue Champness. Historical photo courtesy of Jody Latimer Maurer. 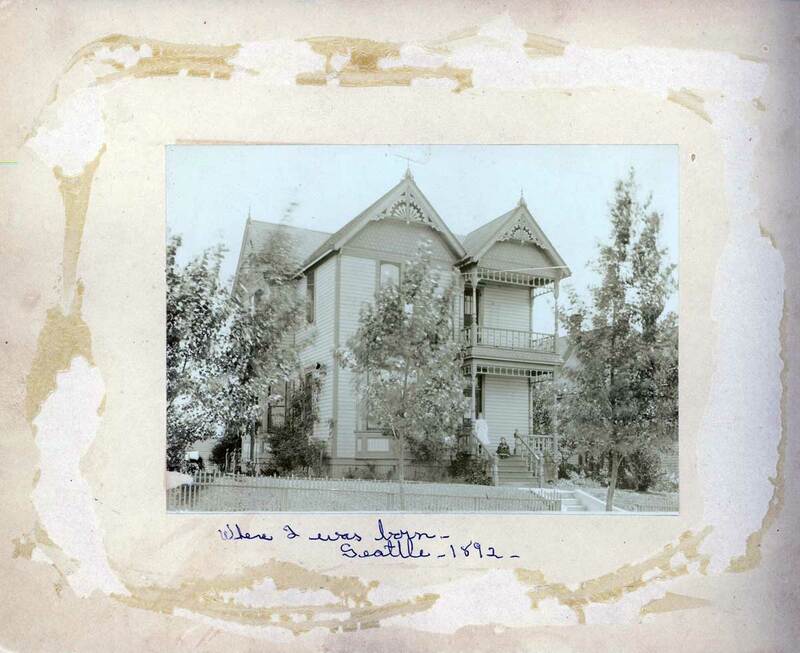 There are certainly two artifacts that have survived the 99 years since the historical view was recorded of the Latimer family – or part of it – posing in the family car and in front of the family home on First Hill. The scene was almost certainly recorded in 1907 because a slightly wider version of the same photograph shows construction scaffolding still attached to the north side of St. James Cathedral’s south tower, far right. The Cathedral is the most obvious survivor. By the time of the church’s dedication on Dec. 22, 1907 the scaffolding was removed. The second artifact is the stonewall that once restrained the Latimer lawn and now separates the Blood Bank parking lot from the sidewalks that meet at the southwest corner of Terry and Columbia. In the “now” Margaret Latimer Callahan stands about two feet into Terry Street and near where her banker father Norval sits behind the wheel in the family Locomobile. Born on July 22, 1906, Margaret is the youngest of Norval and Margaret Latimer’s children. The clever reader has already concluded that Margaret Latimer Callahan will be celebrating her centennial in a few days. Happy 100th Margaret. *The Locomobile used the English configuration for the driver’s position (to the right) until about 1912. Gus (I think his name was Gus.) the normal driver or (that French word) Chauffeur is closest to the camera. He is a big guy with either a lantern jaw or a weak jaw as I remember. On the other side of Gus is Norval. He is all suited up with gloves and riding gear and behind the wheel with his child on his lap. Yes this is Norval and so father is further from the camera than is the big-guy-gus-that-is-not-behind-the-wheel but would normally be because Norval was not a driver and he is only posing like one here. 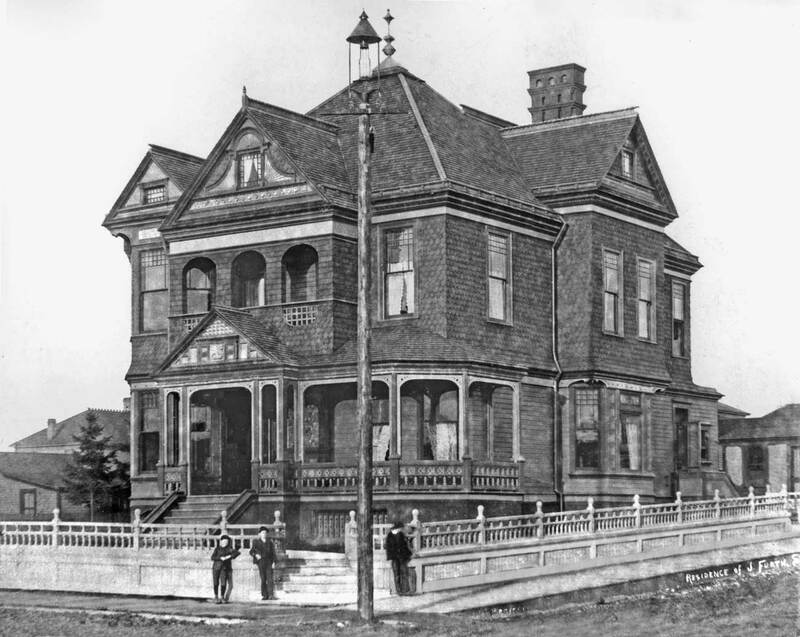 The Furth family followed the procession of the Seattle’s movers and shakers to First Hill in the late 1880s and built this mansion at the northeast corner of 9th Avenue and Terrace Street. 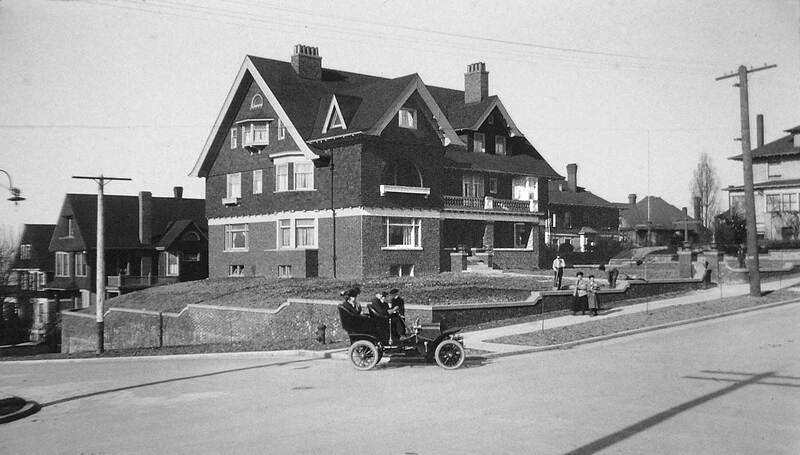 By the early 1900s they had move again, a few blocks to Summit Avenue, and for a few years thereafter their first mansion was home for the Seattle Boys Club. 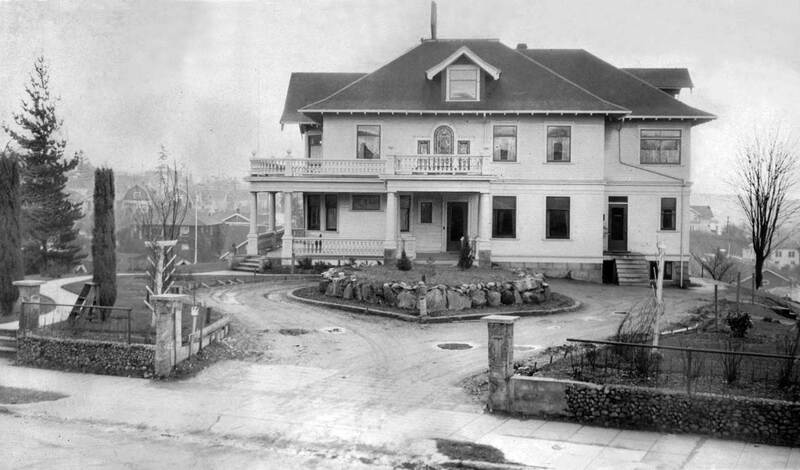 With the building of Harborview Hospital in 1930 Terrace at Ninth was vacated and bricked over as part of the hospital campus. Historical View courtesy Museum of History and Industry. When the Furths moved to Seattle in 1882 their new hometown was enjoying its first buoyant year as the largest community in Washington Territory. (It stepped ahead of Walla Walla in 1881.) 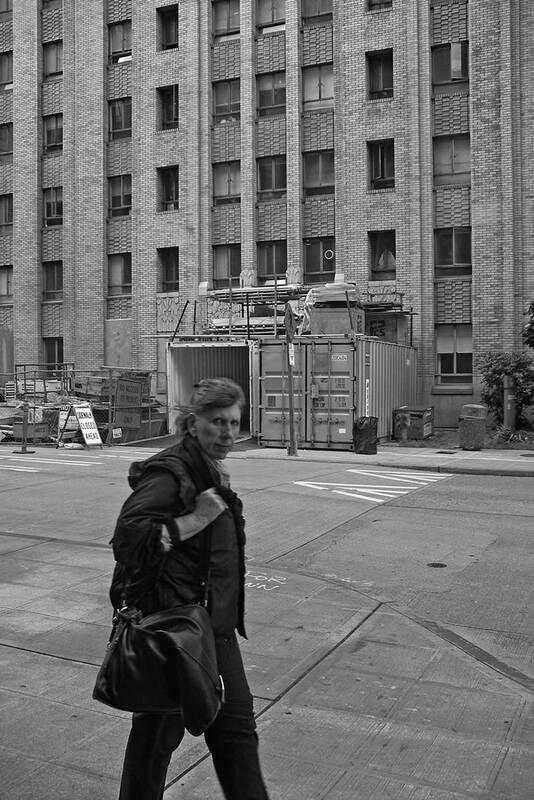 In the next 30 years Seattle would roar, its population expanding from about five thousand to nearly 240 thousand, and much of this prosperous noise was Furth’s contribution, the ringing of his wealth and the rattle of his trolleys. Born in Bohemia in 1840 – the eighth of twelve children – at the age of 16 Jacob immigrated to San Francisco, and managed during his quarter-century in California to express his turns as both a brilliant manager and caring citizen. In 1865 Jacob married Lucy Dunton, a Californian, and with her had three daughters. Once in Seattle with the help of San Francisco friends he founded the Puget Sound National Bank, and was in the beginning its only employee. 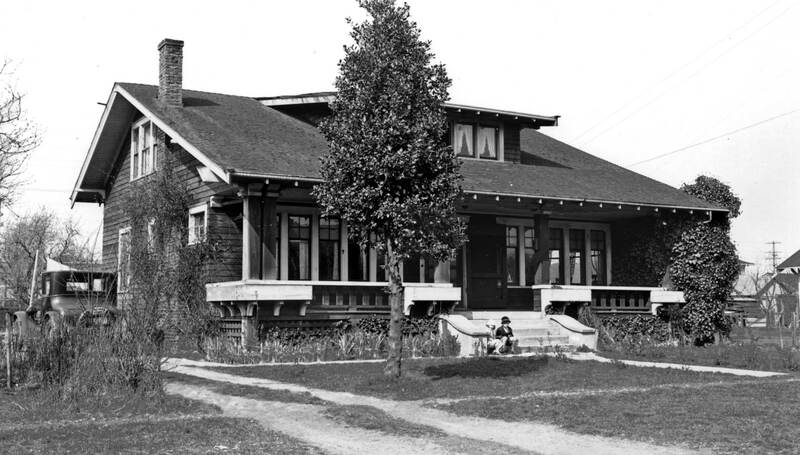 After Furth built this substantial family home on First Hill he continued to list himself as the “cashier” for the bank. But he was effectively the bank’s president long before he was named such in 1893. Then photograph. 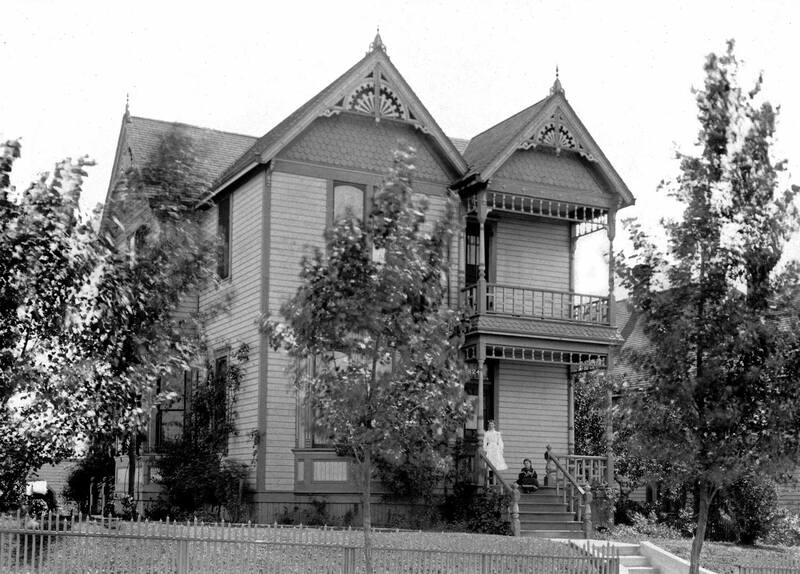 Built in 1890 the above Victorian vestige on Eastlake Avenue survived until 1961. (Courtesy, Special Collections, University of Washington Libraries.) 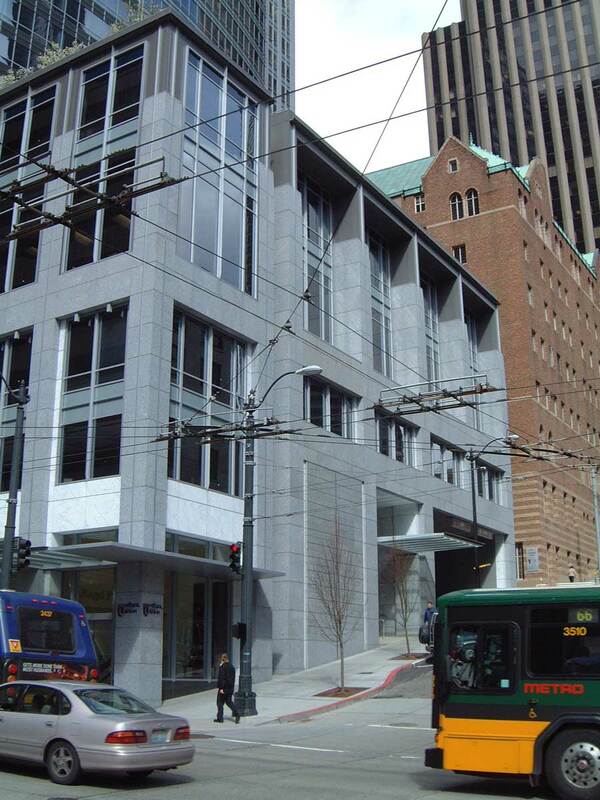 Completed in 2001 this home, below, to the Howard S. Wright Construction Co., the UW Physicians, and the Pro Sports Club is the third structure to hold the northwest corner of Eastlake Avenue and Republican Street. A half century ago – nearly – the Wallingford residence, above, at the southeast corner of 44th Street and Meridian Avenue was smothered in asbestos siding and shorn of much of its original charm. Since its imaginative restoration in the 1990s the home is a Wallingford Landmark. Historical photo courtesy Washington State Archives, Bellevue Community College branch. 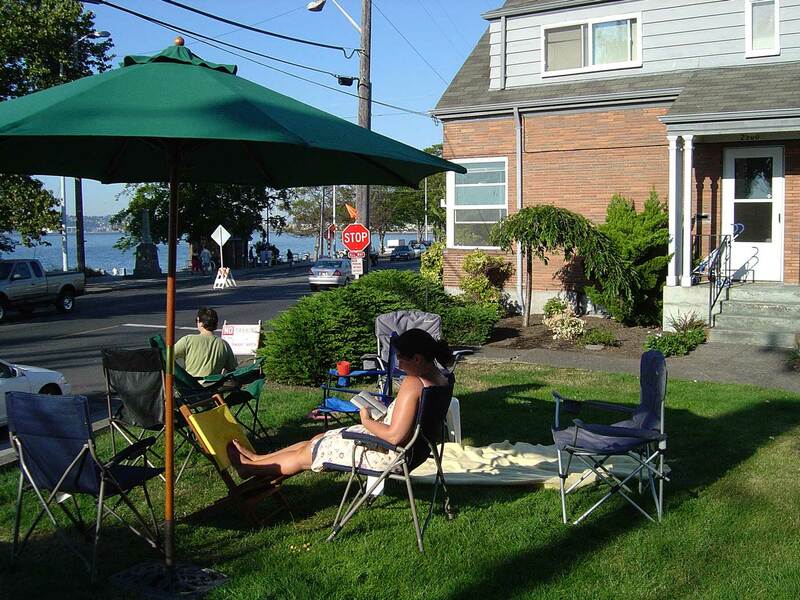 Chris and Mary Troth moved into their “classic Seattle box” at the southeast corner of 44th Street and Meridian Avenue (in Wallingford) as renters in 1993. In less than a year they persuaded their absentee landlord to sell it to them, and since the couple first met in architecture school at the University Oregon their new home was perhaps inevitably in store for more than a fixing-up. The first sensitive “issue” was the concrete asbestos shingles that were sold sometime after WW2 to a former owner by some persuasive siding salesman. They appear in the 1957 tax photo printer here. An earlier tax photo from 1937 – not printed here – shows the home with its original clapboards. That depression era photo was a guide for the couple’s restoration, and like many homeowners the Troth’s found that most of that old wood siding that the ’37 photo showed was still intact when the asbestos was removed by masked men in white uniforms. The “plantation effect” followed the couple’s decision to add a second open floor while restoring the original front porch. 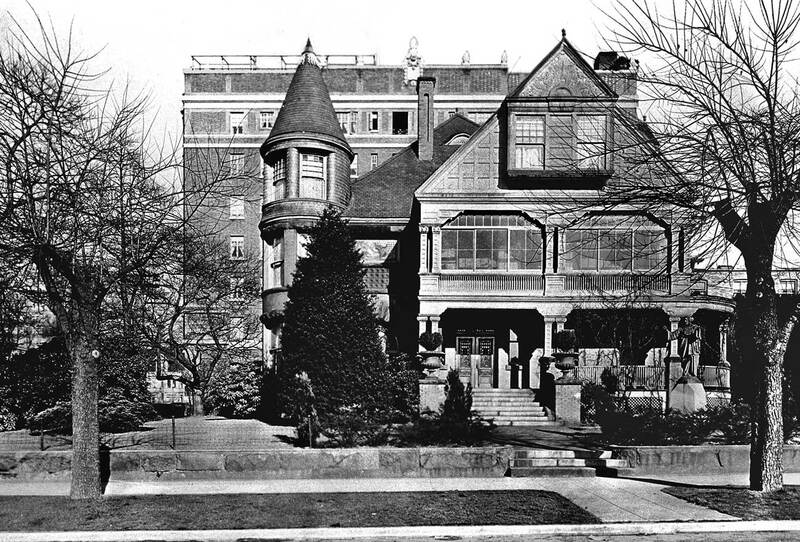 In 1917 when the 1908 residence was first converted into a multifamily dwelling, the steep and exposed stairway to the second floor, showing in the 1957 photograph but not the “now”, was attached to the building’s south façade. The landlord Troth’s desire to reach their second (and third) floor apartment out of the rain drew them into the labyrinthine variance process required to get permission to build their inspiring two story portico. 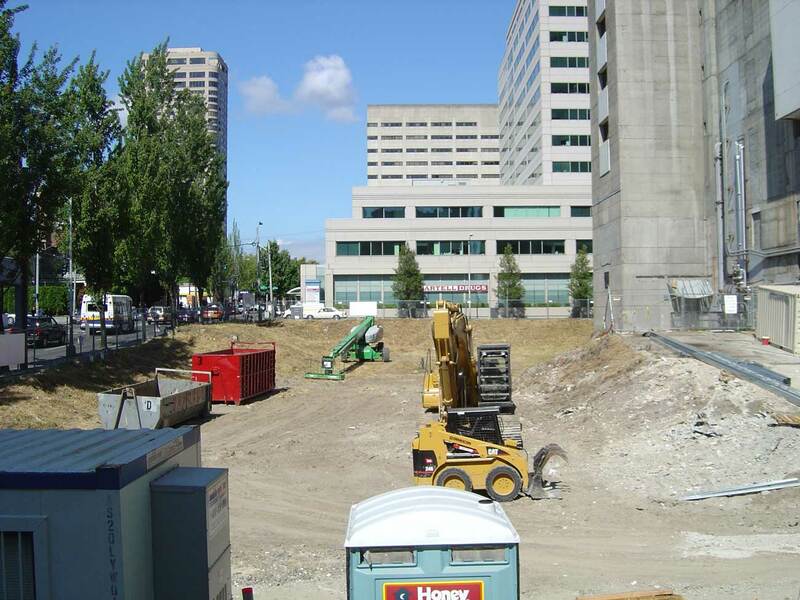 Above: The two Seattle Gas tanks behind the Pioneer Denny home were constructed in 1907 when some of the Denny’s fruit trees were still producing. Built in 1871, the here, in 1911, abandoned and soon to be razed home faced Republican Street, on its north side between Dexter and Eighth Avenues. Courtesy, Lawton Gowey Below: Looking northeast across to a Republican Street between Dexter and 8th Avenues that was lowered considerably during the 1911 regrade. This is "correct" repeat for the "then" of the Denny Home pictures above on the north side of Republican Street. 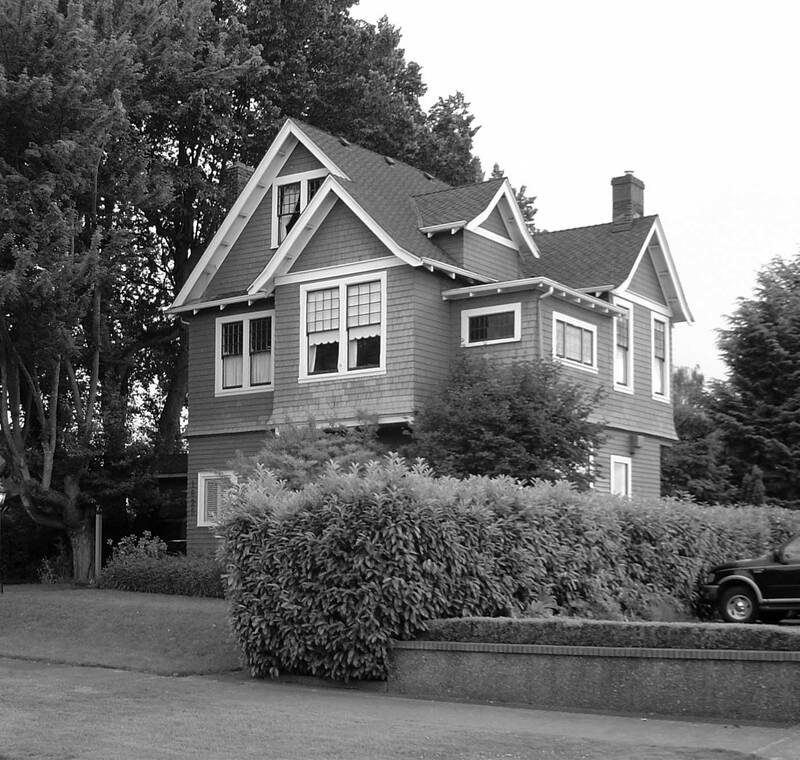 Louise and David Denny’s home faced Republican Street at the north end of Denny Hill. The pioneer couple, of course, named it “Republican” for obvious reasons. Here the street is being lowered about twenty feet below its old grade. 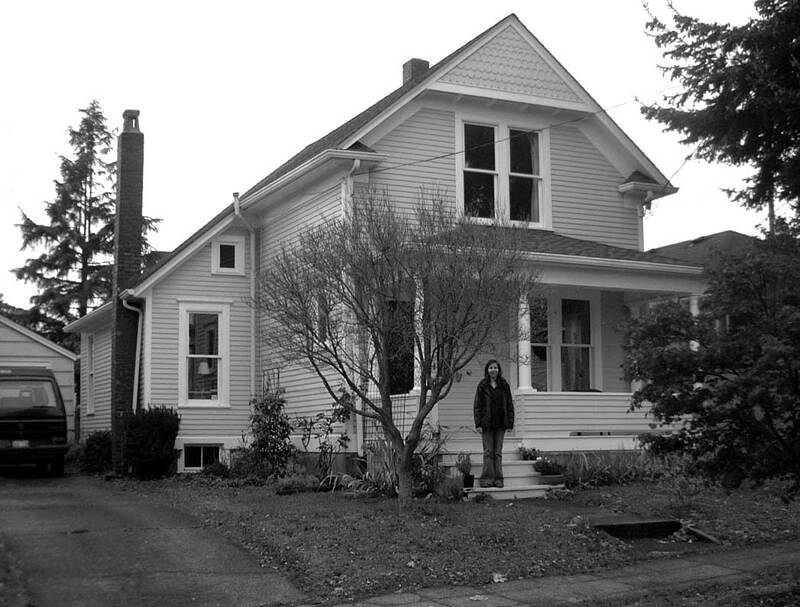 This was their first big home and with its extensive garden both were typically described as “overlooking Lake Union.” The front door, however, looks south in the direction of the city, although in 1871 it was still far from town and nearly surrounded by a forest that this original pioneer family continued to harvest for many years more. After 1882 the family could see the largest lumber mill in King County at the south end of Lake Union, and they owned it. The Denny’s lived here until 1890 when they moved a few blocks west to an ornate pattern-book mansion at Mercer Street and Temperance Street, another Denny street name. The Republican Denny was also a tea-totaler and by the time of his death in 1903 his political preoccupations were better served, he explained, by the Prohibition Party. Certainly, the “many social gatherings” in all their homes – beginning with the log cabin near the waterfront foot of the Denny Way – were consistently dry. On the Brewer House, and others of that age in WA: the siding is not clapboards, it is “shiplap”. Clapboards are sloped like cedar siding, but they are of consistent thickness like modern “Hardie board”. Bevel siding is put on with mitered corners. Clapboards (East Coast) and shiplap are put on with cornerboards. But shiplap is flat, with rabeted edges. This is not just siding: it is the structural sheathing too, made of Doug.-fir instead of cedar. When the cornerboards leak in a decade or two, rot and racking set in, and that was the end of most Victorians. Thanks for the lesson Mark. I’ll go hunting for examples with your distinctions soon via Google. Thanks for the primer. I don’t think your “now” photo of Republican St could be facing northeast since it shows the Space Needle, which is due west of that site. Yup you caught it. I put up the wrong NOW photo. I’ll change it in a moment. I don’t know if you will believe this, but I too saw the impossibility of it being the right one late last night, but then amused myself with the hope that someone would notice – and you did. I’ll make the change – next – and also put up an addendum or addition to the other Republican house feature in that group: the one at Eastlake and Republican. thank you very much for your efforts to keep history alive.